This chapter provides an overview of procedure required to install Incident Analyst V5. Incident Analyst V5 fully integrates the collection, management and resolution of adverse events into one efficient application. The extensive use of User defined lists and triggers, ensures that your facility has the ability to collect the information you require when you require it. Incident Analyst V5 includes an extensive set of features and functions that make event reporting and management intuitive for Users while allowing complete customization without programming. Proper planning is the key to a successful implementation of Incident Analyst V5. It is important that the various elements and the review processes are defined and documented prior to implementation. You should also complete the Incident Analyst V5 training and visit the demonstration site www.ccdsystems.com to view examples of the results of the implementation process. Given the flexibility of this application, it is important to recognize that the ease of implementation will be directly related to the extent of your implementation planning. Your Incident Analyst V5 installation CD contains three databases and associated Web sites. The demo database has been included to provide samples of various types of event types, notifications and collection lists along with the associated filters. The Web pages associated with this database contain ‘Testing’ in the header to avoid any confusion. The second database is the training database. Once populated, this database should be identical to your live database with the exception of the events. The training database is used to train additional system administrators, test new releases prior to implementation and validate any changes to the system set-up prior to their implementation. The web pages associated with this database include ‘Training’ in the header. The Live database is used by staff to record real events in their facility. This database is the one that collects and stores all your collections lists and information for use on the Live web pages. Outlined below is the recommended process for implementing Incident Analyst V5. Review the existing event management process and associated documentation. Complete the Incident Analyst V5 training program. Utilizing the training website, ensure that the event report and review processes function as required. Utilizing the database management tools in the System Management tab, export the training database and import it into the live database. Run the ‘Delete All Events’ script against the live database to remove all the testing events. A detailed installation checklist is included in Appendix ‘Implementation Checklist’ attached to this document. There is also an example of CCD’s Implementation Timetable, as well. CCD Systems is available to provide installation assistance on a consultation basis. CCD can be contacted at 1 (800) 862-9939 or by email at sales@ccdsystems.com. Help can be found in one of two ways: using the F1 key or by using the Help menu. The User’s Guide will be opened when the F1 key is pressed or if the Help File option is selected from the help menu. Users can view information regarding their version of Incident Analyst V5. This will also include the Modules button, where administrators are able to print a list of the modules installed with their system. From Creation to Closed, Incident Analyst V5 Administrators can control what happens at each step of the event’s work-flow process. All events progress from start to finish through a sequence of phases. As an event enters each phase, a number of workflow tasks are initiated. Among these is the notification process which is possibly the most important. E-mail messages are sent to all functions that have been identified during the set-up. Besides notifications, new questions may be asked as the event goes through the review process and proceeds through the various phases. Phases are equivalent to a Review step. The event can be Reviewed and moved into the next phase by privileged managers. These managers may move events backwards, into the previous phase, as well. This may occur when an event has been mistakenly moved forward. When an event is moved to the next phase or returned to the previous phase, it will notify the proper people so they may review the event. Users will also receive notifications when the event has remained in a certain phase for an extended period of time. Phases are able to appear in specific event types as well. Administrators can use Type Maintenance to select which phases will apply to which event types. This tailors questions to suite the phase. All information, including comments, is relative to each phase. There is a diagram of a sample work-flow below. The purple ovals are examples of user-defined phases while the others are pre-defined and shipped as part of Incident Analyst V5. While an event is in the process of being created, but not yet finished, it exists in the Entry phase. When page one of the event entry screen is displayed to the User, the event has not been entered into any phase. When the User clicks the ‘Next’ button, bringing up page two, the event enters the ‘Entry’ phase. From this point on the event cannot be removed from the database. More information on this phase and what is required in it is described in the Incident Analyst V5 Web User’s Guide. After the user clicks the ‘Submit’ button when entering an event, the event is forwarded to the ‘Event Created’ phase. This is an intermediate phase. As such, it’s not often that collection lists and other tasks and items are assigned to this phase. It is recommended that the Event Created phase be set to automatically forward events to another phase as soon as possible, such as a Management Review phase. Abandoned events are created when a User cancels during the event creation process. This means that page one and page two of an event were both created, but the ‘Delete’ button was pushed before the event was submitted. An event can also be manually abandoned by a user with the correct permissions on the website. To do this, search for the event. Once the search listing appears, view the event. At the bottom left hand side of the page, there is an ‘Abandon’ button. Click it. An event in this phase cannot be modified in any way, but they can be included in event counts and while searching for events. Events can be closed at any time by User’s with sufficient privileges. When an event is closed, it no longer appears and e-mail links will no longer allow Users to view the event. The de-identification process is initiated by running the De-Identification Wizard. This process removes all participant names and identification details from selected events. For more information on de-identification, please refer to the Wizards section of this manual. These are events that have had the deleted flag set on. An event is usually flagged as deleted when the user clicks the ‘Delete’ button. Events can be deleted by the Creator before clicking the button on the last page of the entry process. After an event is created, only people with the correct privileges will be allowed to delete the event. Events in this phase no longer appear in reports nor can they be included in search criteria. When an event is purged, it is taken out of the system permanently. Purging an event requires that the event be deleted first. All information relating to the event is also removed from the database. Unlike the recovery of accidentally deleted events, there is no ‘un-doing’ of the purge process. The Risk Management department may add an unlimited number of phases and assign them to the various event types. Users do not need to know which phases apply to which types or in what order the phases occur. These phases are extremely important. Without user-defined phases, events will move directly from the ‘Event Entry’ phase to the ‘Closed’ phase. For smaller facilities, this may be acceptable but larger ones should want to avoid this. User-defined phases enable the events to go through phases such as a Risk Management phase or a Supervisor Review phase. This allows different questions to be asked at specific times and different notifications to be sent out to specific people once an event reaches a certain point in the phase progression of that event type. Before an event will progress through a phase, it must be assigned to an Event Type. For more information on assigning phases, see the section titled, ‘Type Maintenance’. In Set-Up Lists, use Code Maintenance to access the Event Phase List. Click ‘New’. A modal form will open. Type in the code, label and a short description into the text fields. Select the numerical position or order of where the phase fits into the work-flow process. Next, Administrators are able to choose the fields Font and Background colours. Field fonts and colours are used to visually separate the questions asked in each phase. The Auto Advance Phase is meant to deal with circumstances that are outside of the normal phase progression. Under normal circumstances phases would progress in the order defined by the Position value, as a User advances the event. In other circumstances, (for example, when the responsible person goes on holiday and the event is neglected) Auto Advance is able to over-ride normal phase progression after a certain time period has elapsed. This helps ensure that all events are looked after as soon as possible. 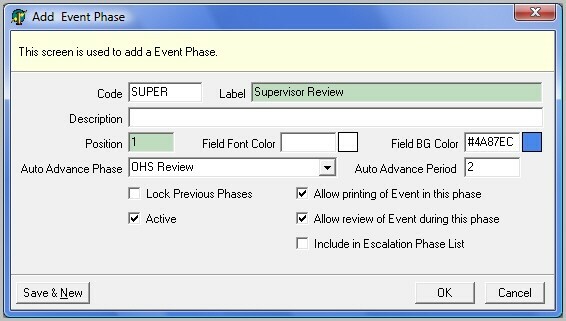 First set the Auto Advance Phase to the phase you would like to have the event advanced to (for example, you could move the event from the Created to the Supervisor Review phase). Next set the Auto Advance Period, when you would like the event advanced. The Auto Advance Period determines the number of days an event can remain in a specific phase. A number of 0 would indicate that the event is to move to the Event Review phase immediately after entering the Event Creation phase. A number over 0 (3 for example) would indicate that the event is to be moved to Event Review only if the event remains in the Event Created phase for 3 days. If the phase is advanced manually before the Auto Advance Phase can take effect, this setting will not affect the work-flow process. The check boxes below allow for more options when dealing with phases. These are listed below. Lock previous phases When an event is in this phase, all phases before will not be able to be edited. Active This means that the phase is active and events will pass through it. Allow printing of event in this phase If this box is checked, Users may print the event. Allow review of event during this phase This sets the phase so that if reviews are unwanted during this phase, they cannot be performed if the box is not checked. Include Phase in Escalation List This option is selected when events may follow a slightly different phase progression that what is assigned at the type. This may depend on a variety of things including answers given during event entry or a review. The escalation phase list is displayed in the Event Administration collection list on the website. When selected, the event will then go through this phase as well as all others assigned. To assign phases to types, please see the ‘Type Maintenance’ section of this manual. In order to properly set up your Incident Analyst V5 products, an understanding of the hierarchy is needed. 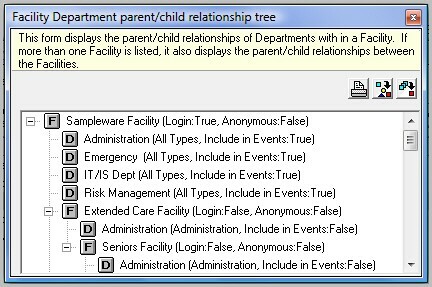 In Incident Analyst V5, facilities are structured with a parent-child relationship. Each facility has a parent and a child. The parent is usually the larger organization and the child is the specific branch. In the example below, the parent facility is Sampleware Region and Gas while Sampletown Branch is the child. All facilities must be assigned to a parent. Each department type and department must be also be assigned to a facility. Each child facility also has departments and department types. Administration and Maintenance are the department types below while Accounting and Payroll are the departments for the Administration department type and Landscaping and Vehicle are the departments for the Maintenance department type. Parent departments may also be used for reporting purposes. Reports cannot be run on parent types while they can be run on parent departments. 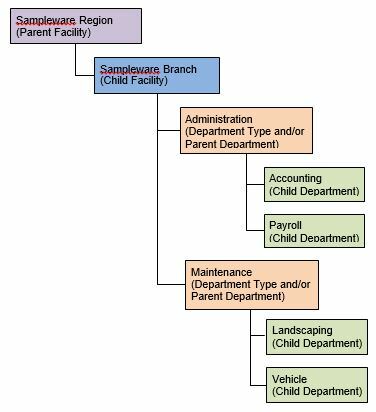 Often, parent departments are named similar to department types and in the facility-department hierarchy would also hold a similar position. In Incident Analyst V5, double-clicking on a facility will open a form. Click on the departments tab. At the top of the form, there is a button marked ‘Hierarchy’. This will allow you to view the current facility and department hierarchy in your Incident Analyst V5 product. The facility will be listed with the child facilities, parent departments and child departments indented underneath. This form may look similar to the screen shot below. Changes cannot be made in this modal form. This is for reference purposes. For more information regarding departments and facilities, please see the section of this manual titled ‘Incident Analyst V5 Set-Up’. This chapter covers the information required to complete the initial system set-up, maintain User accounts and custom lists. To access the security and system set-up tasks, you must have administrative privileges. Once logged in as an administrative User, you will be able to view and maintain the code tables, collection lists, event types and review phases used to support the event management process. To launch the Set-up module, click on the System Set-up bar located on the left side of the screen. If the module and tasks are not shown, click on the Hide/Reveal button to display them. The Security area of System Set-up is used to restrict access and maintain Users and User privileges. Within this task are four tabs. A role is a group of common tasks and actions used to grant privileges to Users based on their duties within your facility. Roles are necessary for users to use Incident Analyst V5 to its best advantage. For example, Managers are required to know where problem areas are within their department so they would have a role which includes the appropriate report-related tasks, such as running and creating reports. A janitor may have a role to that allows only for creating events. For more information on reports, please see the ‘Reports’ section of this manual. Roles may include tasks such as ‘Event Maintenance’, ‘Web Access’ or ‘Run Reports’. To select permissions for a role, double click on a role from the list. A modal form similar to the one below will appear. To add the appropriate permissions for the role, click the check-box next to the permission you would like to add. If you would like to enable all of the options, click the ‘Enable All’. Likewise, if you would like to disable all of the options, click the ‘Disable All’ button. Ask someone who already has access to the action to grant it to one of the roles assigned to your user. If you regularly need to assign to roles actions your currently-logged in user does not have access to, ask a system supervisor to grant your user the “Super User Role Access action, which lifts this restriction. If you are unsure about making any changes, please call your CCD Customer Solutions Specialist. This section will describe the tasks available to be assigned to a role within Incident Analyst V5. Display employee qualifications User will be able to view employee qualifications. Edit Employee User can change details in the Employee’s record. New Worker’s Compensation Claim User will be able to create a new worker’s compensation claim. Edit Audit Settings User can change the settings that control what is audited. Edit profile information User is able to change items such as directory locations, HIPAA compliance and e-mail options, including mail servers. Delete Event Types User can remove Event Types from the Incident Analyst V5 system. Edit Event Types User can make changes to Event Types. New Event Types User can create additional Event Types. Delete Collection Lists User can delete collection lists from the system. Edit Collection List User can make changes to existing collection lists, such as adding/deleting rows, columns. Edit Questions/Alternatives User can make changes to existing questions and alternatives. New Collection List User can add additional collection lists to the system. De-identify Events User can remove identifying information from created events. Delete Events User is able to delete events. Purge Events User is able to remove events from the Incident Analyst V5 system completely. Access Employee Database User can access the employee database when performing searches on the website. Access Patient Database User can access the patient database when performing searches on the website. Access Person DB User can access the person database when performing searches on the website. Access User Database User can access the user database when performing searches on the website. Access via Email User is able to access events through email notifications. Add Attachment User is able to attach a file to an event. Add Comments User is able add additional information to an event using the CCD_Comments collection list. Add Communication User is able to add Communications to an event using the CCD_Communications collection list. Add Cost User is able to add Costs to an event. Add Employee User is able to add employees to the system through the website. Add Follow-up Task User is able to add Follow-Up Tasks to an event using the CCD_Follow-Up Tasks collection list. Add Medication/Product User is able to add medications to an event using the CCD_Medication collection list. Add Notification User is able to add and send notifications to others using the CCD_Notifications collection list. Add Participant User is able to assign participants to an event using the CCD_Particpants collection list. Add Patient User is able to add patients to the system through the website. Add Worker’s Compensation Claim User is able to enter a worker’s compensation claim through the website. Advance Event Phase User is able to move an event into the next available phase. Close Event User is able to close an event. Delete Attachment User can remove attached file from events. Delete Communication User can remove communications from events. Delete Cost User can remove costs from events. Delete Events User can remove events from the system through the website. Delete Medication/Product User can remove medications from events. Delete Person User can remove person participants using the Person Maintenance screen. Delete Worker’s Compensation Claim User can remove Worker’s Compensation Claims from events. Display Info Center User had access to the Info Center. Display My Department – Past Due User will be able to see this listing by clicking on the link provided on the start page. Display My Department – Submitted User will be able to see this listing by clicking on the link provided on the start page. Display My Events – Created User will be able to see this listing by clicking on the link provided on the start page. Display My Events – Not Completed User will be able to see this listing by clicking on the link provided on the start page. Display My Events – Notified User will be able to see this listing by clicking on the link provided on the start page. Display My Events – Participated User will be able to see this listing by clicking on the link provided on the start page. Display My Events – Past Due User will be able to see this listing by clicking on the link provided on the start page. Display My Events – Responsible For User will be able to see this listing by clicking on the link provided on the start page. Edit Communication User will be able to make changes to Communications that have been added to an event. Edit Cost User will be able to make changes to Costs that have been added to an event. Edit Employee User will be able to make changes to employees that have been added to the system. Edit Event User will be able to make changes to existing events. Edit Event Header Information User will be able to make changes to information that has been collected in the Event Header collection list. Edit Follow-up Tasks User will be able to make changes to Follow-Up Tasks that have been added to an event. Edit Medication/Product User will be able to make changes to medications that have been added to an event. Edit Patient User will be able to make changes to patients that have been added to the system. Edit Unfinished Events User will be able to make changes to events that have yet to be completed. Edit Worker’s Compensation Claim User will be able to make changes to Worker’s Compensation Claims that have been added to an event. Export WC Report User can export Worker’s Compensation Claims to the provincial authority. Find Employees in Any Facility User is able to find employees within any facility in the system. If this is not applied, user will only be able to find employees within the facility that the event is created in. Find Events – By Details (Allow Keywords) User will be able to find events by using entered details, including keywords. Find Events – By Details (Allow Question Answers) User will be able to find events by using entered details, including answers that have been specified. Find Events – By Employee User will be able to find events that a specified employee is listed as a participant in. Find Events – By Patient User will be able to find events that a specified patient is listed as a participant in. Find Events – Include Abandoned When a user is searching for an event, the search will also go through abandoned events. Find Events – Include Closed When a user is searching for an event, the search will also go through closed events. Find Events – Include Unfinished When a user is searching for an event, the search will also go through events that have not yet been completed. Find Patients in Any Facility User is able to find patients within any facility in the system. If this is not applied, user will only be able to find patients within the facility that the event is created in. Finish Event Later User is able to go back and finish an event at a later time. Move Event to Abandoned Phase User is able to abandon an event. New Event User is able to enter a new event into the system. Print Event User is able to print an entered event. Re-Open Event User has the ability to re-open an event if it has been closed. Review Event User can review events by clicking on the Follow-Up button while viewing an event. Update Census User can update census information using the Census Maintenance screens. User Web Login User can log into the website. View Attachment User can view files that have been attached to an event. View Audit Trail User can view audit trails that have been set up. View Event User can view entered events. View Help User can use the help links within the website. View Worker’s Compensation Claim User can see the information added into an entered Worker’s Compensation Claim. This section may contain additional options not listed here depending on what your organization has purchased from CCD Systems. Interface Maintenance User can configure the proper interfaces to run within Incident Analyst V5. For more information, see the section titled ‘Interface Maintenance’. Delete Batch User can remove a batch. Edit Batch User can make changes to a batch. New Batch User can create an additional batch. Activate Data Export Schedule User can turn on the schedule. Delete Data Export Schedule User can remove the schedule. Edit Data Export Schedule User can make changes to the schedule. New Data Export Schedule User can create an additional schedule. Delete Data Export User can remove an export. Edit Data Export User can make changes to an export. New Data Export User can create an additional export. Preview Data Export User can preview an export prior to the action. Run Data Export User can perform an export. Add Project User can create an additional project. Delete Project User can remove a project from the system. Edit Project User can make changes to an existing project. Report Maintenance User can maintain reports, such as add new reports, edit existing report descriptions and view roles that have access to reports. Run Batch User can run a batch of reports. Run Census Report User can run a census report. Run Custom Report User can run a custom report. Run Standard Report User can run a CCD Standard report. Display Cause Analysis User has access to the CCD Root Cause Analysis module. Find Root Cause Analysis User can search for a root cause analysis. New Root Cause Analysis User can create an additional root cause analysis. Licensing User can add, remove, and view current Incident Analyst V5 licenses within the Configuration Utility. Import Employees User can bring employees from another system into Incident Analyst V5. Import Events User can bring events from another system into Incident Analyst V5. Edit User Rights User can make changes to user’s rights and permissions. Manage Account Policies User can maintain account policies including length of passwords and what characters are required. 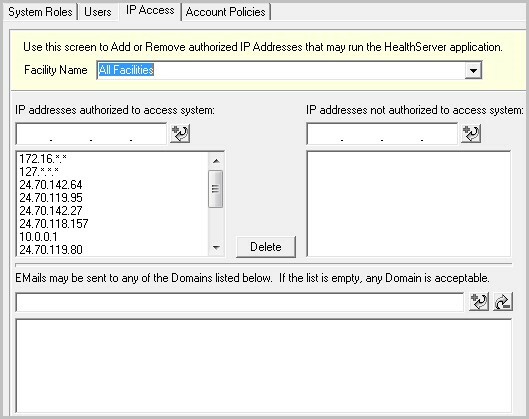 Manage IP Access User can assign which IP addresses are allowed to access Incident Analyst V5. 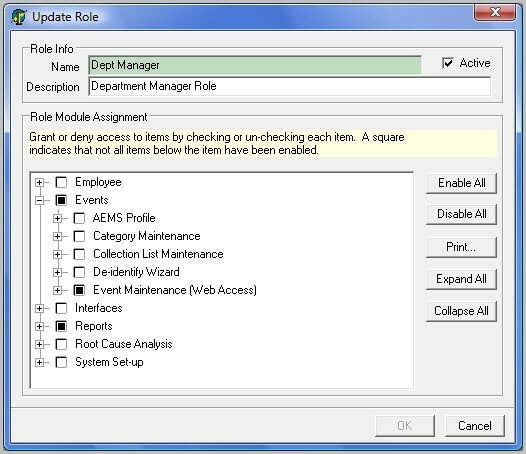 Manage Role User can make changes to the tasks assigned to a role. Manage User User can make changes to all users such as account expiry dates, name changes, and facilities. Super User Role Assignment User has the ability to assign tasks they don’t currently have access to themselves. User Can Change Their Password User is able to change their password through the website’s configuration menu option. Add Employee User can add employees using the Configuration Utility. Add Patient User can add patients using the Configuration Utility. Edit Employee User can make changes to employee records using the Configuration Utility. Edit Patient User can make changes to patient records using the Configuration Utility. Not all of these steps need to be followed under most circumstances. Most often, the facility, departments and roles will have already been created. In this case, it would be possible to proceed directly to using the New User Wizard and begin by creating an employee then a user. As an administrator you may limit access to the system, both the Windows portion and the website, to a range of IP addresses utilizing a wildcard [*] or to an individual IP address (typically for remote access). You also have option of blocking access from specific IP addresses or groups of IP addresses, typically from within a range of authorized IP addresses. To add an address to either the authorized or not authorized list, simply type the address in the address field and click the add button. To delete an address from either list, click the delete button. Administrators are also able to limit which e-mail domains are able to receive an email. Type the address in to the text area and click the add button. If you would like to remove an address from the list, highlight it and click the remove button. The options available in this tab are extremely useful to ensuring security. These options are also HIPAA (Health Insurance Portability and Accountability Act, USA) compliant. Force mixed-case passwords Passwords must have both capital and lower case characters in their passwords in order to be valid. Force use of numeric characters Passwords must have numbers in it in order to be a valid password. Force use of special characters Passwords must have special characters such as _ and % in order to be valid. Force a minimum length of characters A user’s password must meet the specified length in order to work. Prevent password reuse within a number of days A User cannot use the same password within the specified time span. Require a new password within a certain amount of days Passwords must be changed within this time frame. Lockout user after a number of failed logins A User cannot log in if they have unsuccessfully logged in this many times. Prevent reuse of a number of previous passwords A User cannot re-use this number of passwords that they have used before. For all items within system set-up, the code field is used to specify an abbreviation for the item to save space on a form and the label field is used for display purposes including pull-down lists. All modal forms have two buttons; an ‘OK’ button to accept the entry and return to the previous screen, and a ‘Cancel’ button to cancel any edits and return to the previous screen. Some modal forms also have a ‘Save & New’ button to save current changes and initiate the addition of multiple entries prior to returning to the main screen. Throughout this manual we will refer to “modal forms”. These are windows that appear for gathering more information, and the main application is not accessible while one of these is on the screen. You will need to close the modal form (usually by clicking on the ‘OK’ or ‘Cancel’ buttons) before using the other areas of the main application. This section is used to enter the collection lists, departments, questions and more, that will form your website. To enter a field, select a choice from the Tree View on the left, questions, for example. Expand the Question Groups to view the questions already in the system. Click the ‘New’ button at the bottom of the page. A modal form similar to the one below will open. Modals forms will be different for each selection made from the Table List. The example below is to add a function into the system. Select a Question Group from the drop-down list. Type a code in the next text field. The code must be less than ten characters. Enter your question into the ‘Question Text’ field. If you would like to add another, click ‘Save and New’. If you would like to save only the information you just entered, click ‘OK’. Items that are shown in the grids with a grey background are CCD items. This might include things like collection lists, causes or alternatives, among others. The core information of these items may not be changed, such at the label or code, however certain information, such as position, may be. This is the default tab. From here, administrators can add, edit, delete or view codes from selected tables by clicking on the scroll bar, or tree view, located to the left of the grid. The Facility, Function, Department, Formulary, Employee, and Client tabs are also included in the tree view. Many of the items in the list use a modal form to enter information, although others may not. In order for the records to be viewed in events, the ‘Active’ flag must be set on. To maintain a list, select it from the tree view. To edit a specific item within the list, either click ‘Edit’ or double-click the entry. Double-clicking an entry will show the details for that item. Print Grid This will open a second window which will allow you to preview, then print, the grid. In cases where the items included in the grid are sorted into groups, such as alternatives and event types, only the groups that are expanded will print the items underneath. Otherwise, only the group’s name will be printed. Export Grid This will allow you to export the grid to a .txt, .csv, or .html file. You will also be able to choose where this file is saved. Beside the series of buttons there will often be a check box. Check this on if you wish to see the deleted records for the list you are viewing. This tab is used to set up the basic information related to the facility. Select the type using the drop-down. Next the parent facility should be selected if one exists. For example, Sampleware Children’s Hospital is a wing in St. Sampleware General Hospital. Sampleware Children’s Hospital would be the child facility while St. Sampleware General Hospital would be the Parent facility. Enter the facility code, region code, name, province, and description. Ensure the ‘Active Record’ checkbox is selected in order to include the facility in the website. Check the Default Facility if you would like this to be the facility that is automatically logged into. Check the ‘Allow Login for this Facility’ if you wish for this facility to be selected from a drop-down prior to creating an event. This tab is where departments are assigned to a facility. 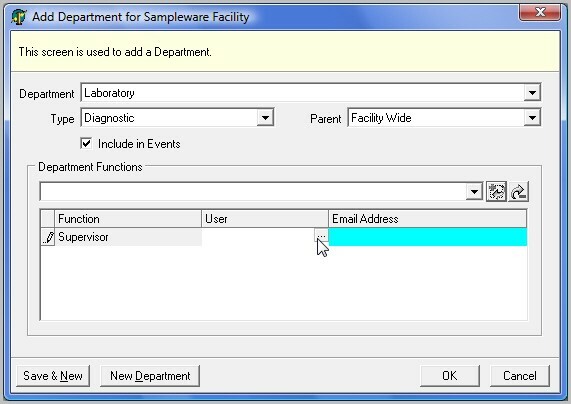 To add a department to a facility, click the ‘Add’ button. Use the drop downs to select the department to add to the facility, department type, and parent department. Parent departments allow departments to be organized even further. For example, a facility may have a Critical Care department type with the department of ‘I.C.U.’ below it. I.C.U. would then have department underneath as well. This may include ‘N.I.C.U’ and ‘P.I.C.U’. Functions for the department can also be assigned here. If the department is a parent department, this will also apply for the children department. Select the function from the drop-down and click the ‘Add’ button. Likewise, if a function is to be removed, click the ‘Remove’ button. Once a function is added, the user’s information must be added as well. You may search for a user by clicking the ‘…’ button. The e-mail can also be entered into the next field. Occasionally, two people may need to be assigned to the same function. If this is the case, the e-mail addresses must be entered into the address field. Separate the two addresses with a comma (,). The address field supports the use of up to 50 characters. The functions assigned here can be assigned automatic and exceedance notifications in Type Maintenance. If the department required is not listed, the option to create a new department available through a button at the bottom of the form. If more departments need to be entered, click ‘Save & New’. If no more need to be entered, click ‘OK’. The Event Types tab allows Administrators to view which types are currently assigned to the facility. Changes cannot be made in this tab, however types can be added and removed in the Type Maintenance module. To delete a facility, right click on the name when you are in the grid. Select delete. You may also highlight the facility and click the delete button at the bottom of the grid. This tab allows Administrators to add, edit, or remove Functions from departments. Functions are similar to an employee position. An example would be ‘Chief of Staff’. This is useful in the case that a User does not know the name of the Risk Manager. Functions within a department may receive notification of adverse events. Functions are used when Administrators wish to automatically notify functions through the Follow-up Actions. For example, the Follow-up Actions lists ‘Notify Risk Manager’. This will notify all the people assigned to the Risk Manager Function. Use the grid shown below to edit, add, or remove functions. Select a function on the grid. When double-clicked, the modal form below will open. To add a new function, click the ‘New’ button at the bottom of the screen. The same modal form will appear. To add a new function, fill out the required information and click OK. Change the necessary information and click OK. To remove a function, highlight it in the grid and click ’Delete’. If you would like to edit an existing function, double-click the function in the gird. The Update Function modal will appear. Change the information you would like and click OK. The departments tab is used to manage the departmental structure of the facility. Departments are of particular significance to Incident Analyst V5. It is the functions that you define for the departments in combination with the notification rules that determine where event notifications are sent. To add a department, click the ‘New’ button at the bottom of the screen. A modal form will open. If you would like to edit an existing department, double-click on its name in the grid. The same modal form will appear. Type a code into the text box. Then enter the label and description as needed Select the ‘Active’ checkbox if you would like the department to be included in events. The department listing below the active check box is read only. This section displays the facilities that the department is currently assigned to. Please see the Facility Tab section of this manual for information regarding assigning departments to a facility. Employees can be viewed, added or removed from here utilizing the employee grid shown below. Employees can be added by double-clicking on the name or by clicking the edit button. A new employee can be added by clicking the new button. A modal form similar to the one below will appear. Use the text boxes and drop-downs as required to fill out the necessary information. Select the ‘Active Record’ check box. When you are finished, click ‘OK’. You may cancel at any time by clicking on the ‘Cancel’ button. To remove an employee, select them in the Employee grid. Select the ‘Delete’ button at the bottom of your screen. For more information regarding employees and users, see Employees and Users in the Security section. To add a client, click the ‘New’ button at the lower left hand side of the grid. A modal form will be displayed allowing administrators to input the client’s information. This is where addresses for the client will be entered. To add an address, click on the ‘New’ button. A modal form will appear. This stores the clients various telephone numbers. If you would like to add another number, click the “New’ button. If you would like to delete a number, click the ‘Remove’ button. To add a note regarding the client, click the ‘New’ button. Enter the comment or note into the highlighted line. Click ‘OK’. If a note is to be deleted, select the ‘Remove’ button. To update a client, simply double click their name on the grid and follow the steps needed to add a client to change the required information. The Agency is used to track various manufacturers, vendors, and other such organizations that a facility deals with. An agency must first be classified into an agency group, such as ‘Manufacturer’ or ‘Supplier’. When you are adding or editing an Agency, there are 2 tabs, General Tab and Contact Information Tab. Enter the agency’s code and group as well as its label and description. Enter the GST, SIC, Rate, Worker’s Compensation, and Corporate numbers. Select the ‘Active’ checkbox. When finished, click ‘OK’, ‘Save and New’ or move on to the next tab. If you do not wish to add this agency, click ‘Cancel’. Enter the address and city of the agency. Select the province or state from the drop down and type in the postal code. Enter the primary contacts name, email address, phone and fax number. Select their position at the company from the drop-down list. Type in the Earnings contact name and telephone number. When finished, click ‘OK’ or ‘Save and New’. If you do not wish to add this agency, click ‘Cancel’. An Agency Group is a grouping of similar agencies a facility may deal with, such as ‘Vendors’ or ‘Manufacturer’s. Select ‘Agency Group’ from the drop-down list in the Set-up Lists module. The Agency Group grid will be displayed. To add an Agency Group, click the ‘New’ button at the bottom left hand side of the grid. A modal will appear. Enter the group’s code, label and description. Select the ‘Active’ checkbox. When finished, click ‘OK’ or ‘Save and New’. If you do not wish to add this group, click ‘Cancel’. Next, select the Agency option from the Table List drop-down at the top of the grid. To add an agency, click the ‘New’ button. A modal form will be displayed. The agency group must be entered prior to entering an agency. These are specific items used to answer a question. Alternatives are then used if the response type is a drop-down, check many, check one or an image map. For example, ‘Bruise’ and ‘Laceration’ would be alternatives for type of injury. Select the group you would like the alternative included in. Type in the code, label, value and position. Enter the export code to be used when exporting the alternative into another system. You can set the alternative to display a short message or to collect more information. Select the ‘Enable Options’ check box. Select ‘Collect Info’ to ask a secondary question. If an environmental spill was reported to be an oil spill, the secondary question may be ‘Enter the approximate amount of oil involved.’ Enter this question into the text field below. Click ‘OK’. This groups all the causes for a certain event type. For example, everything that could cause someone to slip on the floor would be placed together in a group. The Causal Factors group that may be available to you is used for the Root Cause collection list. All causes assigned to this group may be placed into a drill-down hierarchy in order to direct the user to choosing a root cause. Causes assigned to other groups cannot be used for this purpose. For more information regarding the Cause Hierarchy, refer to the Causes Tab section of this guide. The reason why a certain type of event occurred. For example, a client slipped on wet flooring. The cause would be ‘Wet/Slippery Floor’. Within Causes, there are 4 tabs, General, Parent Causes, Child Causes and Review Items. Enter the code then select the proper cause group. Type in the label and description. Enter the position you would like the cause to hold in the list. Only the label is displayed while creating an event. Move on to the next tab. This tab is used to assign a parent cause to the cause you are adding. This is useful when performing a Root Cause Analysis if the module was purchased. This tab lists the causes what are assigned to be this cause’s child. This tab lists the review items that are assigned to be this cause’s child. Select the parent cause from the drop down list and press the + button. If you would like to remove a cause, click the – button. Census Groups are used within Census Maintenance if this module has been purchased by your facility. It groups similar census items together in order to run the Census Report later on. Enter the code and parent group, if applicable. Next enter the label and description. Click on the Active box. If you would like users to be able to attach documents, check the Allow Attachments box. Enter the number of the position you would like the group to hold in the list. Use the drop down to select the time period that will apply to the group then select the criteria type. These are specific items that you will be able to keep track of using Census Maintenance. Select the group the item belongs to from the drop down list then enter the label and unit phrase before entering the number of the position you would like the item to hold in the list. These are the titles of sections within the web pages. They also contain related taxonomy once the Collection List Maintenance is completed. Some examples of collection lists are Participants, Notifications, and Attachments. Some collection lists, including the ones above, are CCD collection lists, although Administrators are able to create their own based on the facilities requirements. Enter the name, label, description, and position. If a help link is needed, enter the path in the text field. For customization purposes, you may change the width of the table and the border. You may also change the font and border colours. Click ‘OK’. If you would like to add another, click ‘Save and New’ For more information, refer to the section titled Collection List Maintenance. For information on how to build collections that can be seen on the website, please see the ‘Collection List Maintenance’ section of this manual. A list of the communication types available when the CCD_Communications collection list is used. This may include items such as ‘Telephone’, ‘Letter’ or ‘Fax’. To add a new type, click ‘New’. Enter the Communication Type Code, the label, and description. Ensure the ‘Active’ box is selected. Click ‘OK’. This groups all of the contributing factors for an event type together. This is a kind of expense associated with an event or claim. This can be anything from legal fees to postage fees. Enter the code, label, position and description into the text fields. Click OK. The country could be where a facility is located or a participant’s address or any other location you need. Type in the code, label, and description. Use the drop-downs to select the phone mark and postal code mark. Click ‘OK’. A department within the facility (e.g. Accounting or Vehicle Maintenance) Enter the code, label, and description. Click ‘OK’. If you would like to add another, click ‘Save and New’. After a department has been assigned to a facility, the facilities it has been assigned to will appear in the box below. A department will be assigned to a type when the department is assigned to a facility. For more information on assigning departments to specific facilities, please see the ‘Facilities’ section below. Employee’s at the facility, including name, employee number, e-mail address, staff position, and marital status, gender, and birth date. Select a title for the employee you are adding. Enter the first, middle, and last names before entering the employee number and the employee’s preferred name. Type in the email address, staff position, marital status, and gender. Select the employee’s birth date from the modal form. Click ‘OK’. If you would like to add another, click ‘Save and New’. Keep in mind that an employee must be entered into Incident Analyst V5 before a User can be created. For more information on employees, please see the Employee’s and User’s section within the ‘System Set-up’ section. The type of equipment involved in the event. This Set-up list will include information such as the model number, the name of the equipment, status and the manufacturer, where it was stored or used and who serviced it. Type in the code, label, and description. Click ‘OK’. If you would like to add another, click ‘Save and New’. All events will progress through phases where different information will be collected by different people within your organization. Enter the code, label and description. Select the position in which you would like it to appear. The position is the order that the phases will progress through. Select the field’s font and background colours. If you would like to Auto Advance the phase, select the phase you would like to advance it to from the drop-down. The Auto Advance Period is the number of days you would like to give before Auto Advancing the phase. Select the correct option from below. Click ‘OK’. If you would like to add another, click ‘Save and New’ For a detailed explanation of phases, please refer to the Understanding Event Flow section. To add a facility, select the facility type and the parent facilities from the drop-downs. Enter the facility code, region code and the facility’s name. Select the province or state from the drop-down. Keep in mind that in order for a facility to be included, it must be properly licensed. For more information on Facilities and Facility Type, please see the section ‘Facilities Tab’ later on in this chapter. This groups the facility listing into different sections. Some facility types may be ‘Clinic’ or ‘Hospital’. Enter the code, label and description. Click ‘OK’. This groups Follow-Up Actions into groups relating to specific event types. For example, an equipment malfunction occurred. The Follow-up Group ‘Equipment’ is displayed. Possible Follow-up Actions may include items such as ‘Schedule Regular Maintenance’, ‘Research Suitable Replacements’ or ‘Send Equipment For Repairs’. This will display the urgency of the follow-up tasks that has been created. The higher the priority is, the more important it is for the task to be completed quickly. This list will depend on the selections made by your Risk Management team. Click the New button. Enter the code, label and description. Enter the position this priority will hold in the list. Click OK. Abandoned If the task was abandoned or not required any more. Others may be added as required. Click the New button. The window below will open. Enter the code, label and description. Enter the position you would like this option to hold in the list. Click OK. Select the Follow-up Action group from the drop-down. Enter the label, description, and position. If required, you may enable additional tasks along with the follow-up action. This listing will display the options available in the Frequency section of the Cause Analysis section. These can be added and changed as required. Enter the code, label, description and the position it is to occupy in the listing. Click OK. The gender of participants or employees. If you need to add a gender, enter the code, label and description. Click ‘OK’. These may be used to separate questions within a collection list or add simple instructions. For example, a ‘Maintenance’ collection list may use labels to break it up into Last Scheduled Maintenance’ and ‘Next Scheduled Maintenance’. This helps organize the webpage into a format that is easier to read. This lists languages a participant or employee may be comfortable speaking. Enter the code, label and description. Click ‘OK’. Location Types are used to group a number of similar locations together. Enter the code, location as well as the description. Click OK. This is the marital status of employee’s or participants. Enter the code, label, and description. Click ‘OK’. The types of notifications that can be sent. These can include notifications such as ‘Information Only’, ‘Collaboration’, and ‘Manager Review’. Another example would be the ‘Second Opinion’ Notification type will collect two sets of information for the phase requested, one for the original reviewer and one for the second opinion. .Enter the name and description into the text fields. Enter the template name. Select an over-ride action from the drop-down if required. Click ‘OK’. For more information on notifications, see the Type Maintenance section. This is the way a person is involved in the event, such as being the Employee, Client, or Witness. Enter the code, label, and description into the fields. Select a participant type from the drop-down. You may choose from Patient, Employee, or User-Selectable, which is for people like visitors or witnesses. Click ‘OK’. This is the person who reported the event, such as an employee. Enter the code, label, and description into the fields. Select the checkbox if you would like the person type to be used in the Reported By field on page one on an event or if you would like it to be the default option in the Reported By field. Click ‘OK’. This calculates the risk of the same type of event happening again. A score will be presented with different risk ratings attached to each score. The scores are generally from 0 to 100, with 0 being the least severe and the default score to 100, the highest and most severe rating, as it indicates that the event will reoccur. Fill in the code, label, and description. Enter the Probability Score. This score, a number between 0 and 10, is used to determine the Risk Score of an event, which, in turn is used to determine the criticality of an event. The Risk Score is calculated by multiplying th Probability score by the severity’s Risk Score. This can be a province or a state and can be used for many purposes such as where the facility was located. Enter the code, label, and description into their fields. Select the phone mark and country from the drop-downs. Enter the area code and select a postal code mark from the list. Click ‘OK’. Qualifications indicate the training employees may have received, like as First Aid, as well as how long the certification is valid. The employees possessing this qualification will be listed under the Employees tab. Enter the code, label, description and cost into the text fields. Enter the training duration, in days. The Certification Period is how long the employee is certified for that qualification in months. Enter the date that you would like to be notified into the Expiry Notification field. Click ‘OK’. The second tab will display the employees that possess this qualification.The score they received and the dates that the certification was obtained and will expire will also be shown. The questions are the way information is collected throughout the online forms. These are fully customizable to the facility. This can include things like ‘Parent’, ‘Sibling’, and ‘Employer’. Enter the code, label, and description. Click ‘OK’. This groups the review items used in the root cause analysis section. There are many CCD groups included. These cannot be changed with the exception of the position. Grey text indicates these groups. To add a new review item group, click the New button. Enter the Click ‘OK’. This lists the status of the review items that are chosen. There are three options coded by CCD. These cannot be changed with the exception of the position. Grey text in the form indicates that the status is an addition from CCD. To add a new status, click the New button. Enter the Click ‘OK’. These are the selections available to be selected during the cause analysis. There are many causes available that were added by CCD. These, like the two above, cannot be changed except for the position and the grey text indicates that the item is from CCD. To add a new review item, click the New button. Enter the Click ‘OK’. This section also lists status, but this listing applies only to the analysis itself. There are four selections available that were added by CCD. These cannot be changed except for the position and the grey text indicates that the item is from CCD. Severity is the representation of how harmful the event was. Facilities may have many severities or a few. These can be similar to ‘Moderate’, although this does not have to be included. Each label may be changed depending on the event type. For more information regarding label changes, see Custom Severity Codes Tab in the Category Maintenance section. Enter the code, label, description and position into the appropriate fields. Enter the Risk Score Value, which must be between 1 and 10. The risk score field is also mandatory. The Risk Score value is used to calculate the final Risk Score for an event. The number listed here is multiplied against the Probability Score and is used to determine the criticality of an event. The higher the final Risk Score, the more critical an event. This final score may be used to determine a specialized phase progression for a highly critical event. Also enter the export code if this data is required to be exported into another system. Ensure the ‘Active’ box is checked. If this severity is to be listed for ‘Actual’ events, check this box. If this severity is to be listed for ‘Near Miss’ events only, check this box. If this severity is used for both types of events, select both boxes. Click ‘OK’. The Licensing area of System Set-up is used to manage your module, utility and interface licenses. This area is also used to complete the installation and registration of new modules, features and interfaces. At the top of the page is where information relating to installed license keys is displayed. The number of facilities, the license key itself, and the installation date will all be displayed for each module purchased. When each license is registered, a check will appear in the checkbox to the left. To add a new facility, type the license key you received from CCD into the license key text field and click install. The facility will appear in the drop down list below. Keep in mind that an Incident Analyst V5 license key is required for each facility you intend to collect information for. Keep in mind that inactive facilities may be added to the license. To add a task to existing facilities, select the task from the scroll box. Select the required facility from the dropdown and click the ‘Add” button. Repeat this for each task you would like the facility to have access to. If you would like to remove a task from a facility, select it from the task list and click the ‘Remove’ button. Licenses may also be printed for reference in your records. Click ‘Print’ to print a hardcopy of your licenses. This chapter describes the process utilized to build and maintain User-defined data sets – collection lists. One of the keys to the flexibility of your Incident Analyst V5 system is the ability to collect any information you require in the format that meets you Users’ requirements during the most appropriate phase. Prior to defining the collection list details you should add all the collection lists, questions and alternatives using the Set-Up Lists. To build a collection list, select the ‘Collection List Maintenance’ icon to begin and you will be presented with a details screen like the one below. You will note that the screen is divided into two vertical sections. The tree-view on the left is used to select the collection list or row you are maintaining. A new collection list may be added by right clicking in the tree view and selecting ‘New Collection List’. While building a collection list, it is possible to change your mind as to where certain rows belong. This is easily fixable by opening the collection list in the tree view then expanding the rows. Control-Click on the rows you wish to move and drag them to the new collection list. This works best if the number of columns does not match. If the collection list you are moving from has fewer columns than the collection list you are moving to, you will be asked if you would still like to proceed. If the collection list you are moving from has more columns than the collection list you are moving to, you will be prevented from moving the rows. The form on the right is used to enter or modify details with respect to the selected collection list. The list details section displays the basic information with regard to the list you are editing. It displays the group’s name, label, description and the help link that relates to that section. It may also display the phases and the types that use that collection list as well. The buttons on the far right hand side will open modal forms that list the questions, alternatives, and labels used. The modal form will look similar to the one below. To add new records, complete the last row in the list. Click ‘Apply’ then OK. Right click on the item to view a menu. Select ‘Delete’ to remove it from the list. Group name This field is used for set-up utility display purposes. It will appear within the set-up utility only. Group label This field is used for web display purposes. It will appear as the group header on any web page used to collect or display information in this collection list. Description The maximum length is 255 characters. This field is used for reference purposes only. Help This field holds the location of the custom help file designed for the collection list if there is one required. The location of the file is typed into the field. Active Flag De-select the active flag if you no longer want this group to be collected in new events. De-activating the group preserves the integrity of historical data. Group Format This section applies special rules to the construction and use of the collection list. A Rows collection list can only have one row defined, and the user is able to request data be collected for more than one row by clicking an “Add Another”. This would be useful for collecting data when it is unknown when the collection list is built how many pieces of data are to be gathered. A Columns collection list can make it easy to define the collection of additional data in a more tabular format, where an additional definition of the data being collected is defined by the column. An example of this would be when you want to collect the same data value for different spans of time, like “Today”, “Yesterday”, “Last Week” and “Last Month”. Format Options This box is used to collect the basic formatting options for display on the web pages, including background, font, and border colour. The border’s width can also be changed in this section. Phases Used Provides a list of Event collection and review phases that have been linked to this collection list. This sub-section is read-only. To assign the group to a phase and type, use the Type Maintenance form. Types Used Provides a list of event types that have been linked to this collection list. This subsection is read only. To assign the group to a type, use the Type Maintenance form. Column / Row Selection Use these radio buttons to indicate if this collection list is grouped by rows (horizontal sets) or by columns (vertical sets). If ‘Column’ is selected, the labels or questions must appear in the first column and all the response columns will be identical (copies of column two). Fill out the required information and move down to the second half of the page. If you would like to work on an existing collection list, double-click on its name in the list to the left. It will load that lists information. The Web Representation is used to build the collection lists used on the website. The representation displayed provides administrators an idea of how the collection list will appear on the website, including column spanning. To begin, double-click the required collection list from the list on the left. The Collection list will open on the right hand side. The collection list opens with the list’s title as well as a default of one column heading and one row. Use the drop down to select which facility colours to use for the collection list. Right click on a cell to view the menu. Descriptions of the menu are included below. Response Type Blank Leaves a cell without contents. This also allows for longer questions or response types to span columns. Label Places a label in the cell to create a sub-collection list. An Injury Information collection list may have a label for Injury Type containing questions related to the type and location of the injury below with a second label, ‘Treatment’, underneath to collect information regarding how that injury was treated. Drop Down Creates a drop-down list using an alternative group. One alternative is selected. Check Box Allows for selection of one option. For example, a check box is placed beside ‘Supervisor Verbally Notified’ to indicate that a supervisor had been verbally notified of the event. Check Many An alternative list is displayed giving the option to select more than one displayed option. Question Displays a question to be answered by another response type. Text Area Provides an area for written answers. When inserting these fields, entering the maximum characters allowed in the response is mandatory – the system will default to zero characters if nothing is entered in this field. Date Enters a calendar to choose a date. For example, date of injury. Check One An alternative list is displayed giving the option to select only one. Time Enters a time field to choose a time. For example, time of injury. Insert New Column Adds a new column to the collection list. New Row Adds a new row to the collection list. Not all rows in a collection list need to have the same format, however, if an item from the question list is selected it must appear in column one with its response in column two. Edit Properties Cell This can be used to enter various parameters into the cell such as response type, data source, column spanning and more. Column This is used to change the columns name, label, width, justification, and the colours of the background and font. To remove the column name from the web page, clear the label field. Row This is used to enter the name of the row, in which position the row is placed within the collections list, the help link, and the colours used. This is particularly useful when adding a row that has only a label. This row’s colour may be changed in order to make the label stand out apart from the rest of the collection list. Collection List This is used to determine the background, font, and border colours of the collection list as well as the size of the table and the thickness of the border. Remove Column Removes the column from the collection list. Row Removes the row from the collection list. Clear Cell Removes all contents from the cell. Move Row Up Moves row up. Rows can also be moved to another collection list within the Tree View by dragging and dropping the row. Keep in mind that the original collection list as well as the destination collection list must have the same number of columns. To move a row within the same collection list, select the row in the Tree View and right click on it. Select either up or down as required. Repeat until the row is where it is required. This method, as well as the method to move rows down, can be used in CCD collection lists as well. Move Column Left Moves column to the left. Right Moves column to the right. Row Properties Background colour Select the colour of the row using a colour picker. Font Colour Select the colour of the font using a colour picker. Column Properties Background colour Select the colour of the row using a colour picker. Item Properties Response Type Select the response type. There are many fields within the forms for the above selections. Descriptions of these fields are listed below. Response Type This is a pull-down list of the supported field types. These include the choices listed to above. Data Source This field allows Administrators to verify where in the database the alternatives for the Check One, Check Many, and Drop Down lists come from. Alternative Group For the Drop-Down, Check One, and Check Many options, you will be able to choose an alternative group from which to populate. The alternative list may be further refined during Type Maintenance where alternatives should vary according to event type. Question A modal form will open after clicking on the ‘…’ button. This modal form will display all question groups and question currently in Incident Analyst V5. Highlight a question and click ‘OK’. The code for the question will appear on in this field. Label After choosing ‘Label’ from the ‘Response Type’ drop-down, this field will be activated. If there are any labels entered into Incident Analyst V5 they will appear in a drop-down in this field. Max Characters Defines the number of characters that may be entered in a text field. The field size may be larger or smaller that the column width previously defined. Justification This field allows you to choose if a column is aligned to the right, centre, or to the left. Span Columns Use this option to format your data. Some questions or labels may be quite long. Type in a number based on the number of columns you have assigned to the collection list, 2 for example. This number will let the information spread out over that number of columns, 2 columns in this example with three columns remaining for other information. Cell Colour The background colour is in this cell, this entry will take precedence over the column colour. Font Colour The text colour in this cell. Req’d if supplied If a specified item is previously supplied, then this item is required. Mandatory Flag Used to indicate that this field is mandatory. An ’M’ icon will appear with this row on the web pages. This is a tri-state flag. A checkbox with a grey background indicates off and a checked box with a white background indicates the flag is set on. Double-click the box to set the flag on. Start Collapsed This flag determines if the response will begin collapsed on the webpage. This is useful for a question whose answer required a check many list with many options available. Active Flag Used to indicate that this field is active and will be seen on the web page. Clear on De-identify This indicates that this cell will be cleared if the event in which it occurs is de-identified. Link to Question This field is used by Checkboxes, Check One, Check Many, Date, Drop-Down, Text Area, and Time response types. This will link the responses to the appropriate question for reporting purposes. Image Link This allows Administrators to link bitmap images to the answer, which in turn will be links to the question. If your facility wishes to have an image, you would place the image location in this spot. Instructions This field allows Administrators to place instruction for specific questions without using a label. One of the strengths of Incident Analyst V5 is the extensive support of User-defined data collection, workflow management and the ability to time notifications, participation and data collection elements to event types. Event Type are comprised of one or more levels of types. From a data collection perspective, any element (participant, notification or collection list) defined in the top level will be collected in all types below. Any element defined at the lower type level will only be collected in that Event Type. Two screens are used to define and maintain all levels of event types, Type Hierarchy and Type Details. You are able to toggle between these two screens by using the arrow button next to the Type Maintenance title. The first screen is used to define the Type Hierarchy that will be seen on your website. This screen consists of two columns: the Type Master List and the Type Hierarchy. The Master List will display all of the types you entered in the Event Types section of Set-Up Lists. The hierarchy will always begin by displaying All Types. Each type you add will go underneath that. Once a type is on the right, it is referred to as a Type Node. To build your hierarchy, find your top level type in the Master List. Drag it over to the right until it is where you would like it and the section is either highlighted or underlined and drop it. Keep in mind that when you see a blue underline, it means that the type you are dragging over will become the last child type of the Highlighted type. When you see a highlight, it means that the type you are dragging over will be placed where the underline is. Keep Dragging your types over until you’re done. You can have an unlimited number of levels. For example, you would like to add Medication as your top level type. Underneath that, you would like Monitoring Error, which in turn would have Clinical, Documented Allergy, Interaction and Other. Interaction would also have types listed under that as well. Ideally, you would work in order that you would like the types displayed but it is often just as easy to work level by level, starting at the top most type and working your way down to the bottom. What you would do here is Drag the Medication type over to the right until you see that All Types is highlighted then let go. Now, you would drag over the next level types, Clinical, Documented Allergy, Interaction, and Other. This time you will want to make sure that Medication is highlighted. Now you would add the types required underneath Interaction. Drag them over so that Interaction is highlighted. Will the type node be included in the event (displayed on the website)? Will the type node be assignable to an event (people entering events will be able to choose this as their event type)? Will the type node be a process point? This will come into play with Medication event in particular as process points can be chosen in the CCD_Medication collection list. Process points are the part of the process that the event occurred in. If the answer to any of these are ‘Yes’, use the right-click menu to select the appropriate option. These can also be changed on the next screen. These options can be used in any combination. Using the example from above, the Medication type will be included in the event but will not be assignable to an event (this is to encourage users to drill down to find the most appropriate type) and is not a process point. The Monitoring Error type node will be included in the event as well as a process point but will not be assignable to an event. Clinical, Documented Allergy, and Other will be included in the event and assignable to an event, but they are not process points. Interaction has still more types underneath it so it will be included in the event but not assignable and is not a process point. The types underneath however will be included in the event and assignable to an event but they are also no process points. Remember to save often while building your hierarchy. Once the hierarchy is built and these three questions are answered, you are ready to move on to the next screen, Type Details. In this area, you will be able to assign phase progressions, collection lists, automatic notifications and more. To access this screen, you can either double click on the type node you would like to work with or use the arrow button displayed beside the Type Maintenance title. The first section displays the code, the type label, description as well as three check boxes for Include in Event, Assignable to Event, and Process Point. This is the second section on the page. This section will allow you to configure a variety of options for the type you are working with. The Details screen displays the basic information about a type and is used to assign the various options (number of days before a reminder is sent, total allowable duration and confidentiality status). You may also set a type to be confidential in this area. An example of the Type Details area is shown below. Confidential Flag This flag is used to identify that this type, and the ones under it, if any, are to be treated as confidential. Time to Close Duration Defines the number of days allowed between report entry and closure. Events where time is exceeded will appear on delinquent event reports. Initial Review Duration Defines the number of days allowed between report entry and initial review. Reminder notices will be produced for events where this time is exceeded. Disclosure This sets the type to display a disclosure notice at certain severity levels that can be set using the Severity field below. This tab allows Administrators to assign which phases a certain type move through in order to reach the finished state. Phase Progressions can be set at any type level allowing for even more customization. After the user clicks the ‘Submit’ button when entering an event, the event is forwarded to the ‘Event Created’ phase. This is an intermediate phase. We recommend to our clients that the Event Created phase be set to automatically forward events to another phase, such as a Supervisor Review phase. Select a phase from the drop down. Click ‘Add’ to add the phase to the type’s list. To remove a phase, select it from below and click ‘Remove’. This tab allows Administrators to assign which collection lists and rows are viewed for each type. Collection lists are used to support the collection of User defined data sets during any phase of the event management process. Before a group may be added to a type it must have been defined during Collection List Maintenance. This will be indicated by the font used in the listing. An explanation of the fonts is provided below. Bold Indicates that the collection list is a CCD collection list. Regular Indicates that the collection list is a custom made list. Purple This collection list or row is assigned at the parent type level. In some cases, this may be the All Types level. Green This collection list or row is assigned at the child Event Type level. Select a type from the tree on the left. When its information is loaded, it will appear similar to the screen shown below. To add a list to a type, click on the checkbox beside the collection list. A modal form similar to the one below will be displayed. Multiple row or collection list selections may be made by holding down the Control key and using the mouse. This is useful for both adding and removing filters. To add phases to the collection list, click on the ‘Add’ button. A row will appear in the box below. Click on the drop-down list and select what phase you would like the list to be displayed in. Also select the levels of care and facilities if necessary. ‘All LOC and Facilities’ is set as the default. Click OK. Click the ‘Save’ button on the User Enter Lists page. This will allow Users to view the collection list. Rows within collection lists can also be assigned to specific types. This can be done for custom collection lists as well as certain CCD collection lists so only certain fields are visible on the website. Highlight a row, or several rows, and follow the same steps as for assigning the whole collection list. This tab allows certain collection lists to be viewed by Users. To begin, select a type from the tree. Click on the button you would like. This could be Participants, Notifications, Attachments, Causes, Contributing Factors, Outcomes, Standard Procedures or Follow-up Actions. When the information is loaded, click the ‘Add’ button. Fill out the grid by choosing the required options. The options will vary depending on the button selected. Click ‘Save’. Repeat these steps for each type level as required because many types may have different requirements. Choose the Edit button to edit an existing location or click ‘Remove’ to remove a setting. Please be reminded that many of the selections that can be chosen need to be defined in the Set-Up List – Code Maintenance. To add a participation type to the selected type, click the ‘Add’ button. A new line will appear in the box below. Select a facility, participation type, and phase from the drop-down lists. Then select the check boxes for Confidential and Non-confidential. Select the Severities required from the drop-down lists. Select the Auto, and Prompt check boxes if needed. Repeat for each participant you would like included. When finished, click OK. If you do not wish to save your changes, click ‘Close’. Any added participation types can be edited by double clicking on the row in the grid. Facility Name Filtering by facility allows Incident Analyst V5 to be used in a regional setting supporting the continuum of care. Participant Type This field is used to define the type of participant to be collected. Phase This field indicates at what point in the event management process that this participation type is collected. Include if Confidential Flag This flag is used to identify if the participant is collected for confidential events. Include if Non-Confidential Flag This flag identifies if the participant is collected for non-confidential events. Severity This field identifies which severities will trigger this participation type. This section is used to define the notifications associated with each phase within the type. The function that receives the notification and the template to be used are also defined along with the flags to identify if the notification is sent for confidential, critical and/or fatality events. The notification generation processor within Incident Analyst V5 uses exclusionary logic to protect client information as required under FOIPPA. As such, care must be taken to ensure a notification will be generated based on the combination of flags available (defined in the Event Profile). To allow for the exceptional circumstance without generating excessive notification it is recommended that the delinquent event report be run on a daily basis. Under the Notifications button, select the Function, Notify Type, Phase, and Severity from the drop-downs then select the required check-boxes. Repeat for each notification you would like sent. When finished, click OK. If you do not wish to save your changes, click ‘Close’. Function Notifying by function allows the notifications to be sent to departmental or personal mailboxes as defined during department maintenance. Notify Type Used to indicate the type of notification to be sent. Phase This field indicates at what point in the event management process that this notification will be sent, typically to the next report reviewer. Confidential Flag This flag is used to identify if a notification is generated for confidential events. Non-Confidential Flag This flag is used to identify if the notification is sent on non-confidential events. Severity This field is used to identify which severities will trigger a notification. Select all severities if you would like the function to be notified for every event severity. For example, the VP is not part of the event process, meaning that he or she is not required to answer any questions during the review process, but it Is required that they be notified of Severe events, both Confidential and Non-confidential. The person who is the VP has already been assigned to the VP function. Choose this function from the drop down list. He or she does not need to answer questions so you would choose the most appropriate type of notification from the Notify Type, possibly the Information Only notification. As VP this person would most likely want to be notified when the most information has been collected about the event. For our example, you might choose the Follow-Up phase. You would also click the Confidential and Non-Confidential check boxes. Because the VP is only required to know about Severe events, choose this severity from the drop down list. The example notification is now completed. Although any type of attachment may be added to an event, a previous specified on can be used, such as the policy that would relate to the incident. To add an attachment, click the ‘Add’ button to open a new row. Select the facility, phase, and file name. Select the required textboxes. Repeat for each attachment that is needed on and click OK. Causes are the direct reason for the incident occurring, such as an equipment malfunction. To add Causes for an event, click the ‘Add’ button to open a row. Select a facility. Choose the event phase you would like the cause to be available in, and then select the Cause Group. Select the Confidentiality Type and Severity. Repeat these steps. Click ‘OK’ when you are finished. Contributing Factors are things that may have helped the incident occur. To add Contributing Factors for an event, click the ‘Add’ button to open a row. Select a facility. Choose the event phase you would like the cause to be available in, and then select the Contributing Factors Group. Select the Confidentiality Type and Severity. Repeat these steps as needed. Click Save when you are finished. To add outcomes to the type, add a new row. Select the Facility and Phase from the drop-down lists. Select the Outcome Group then the Confidentiality Type and Severity. Repeat the steps as needed. Click ‘Save. The Follow-up Actions section allows Users to choose actions to be performed to follow-up on an event. These may include things such as ‘Notify OH&S’ or ‘Repair Equipment’. Select the facility, phase and the follow-up action group. Use the checkboxes to select the confidentiality that applies to the group. Select the levels of Severity that apply. Click Save. Incident Analyst V5 can be set-up to notify specific individuals on a regular basis when events surpass the specified duration allowed. Select the facility, severity, period type, max count and the user to send the notification to. Also check the ‘Incl. Actual’ and Incl. Near Miss’ as required. Save. If notification is required for more than one individual, simply separate the usernames with a comma. Severity may have different meaning depending on the type. This allows the severity’s label to be changed to suit those differences. The master severity is the same throughout, but what is displayed on the website could possibly be different. For example, the ‘Did not reach client’ severity may be changed to ‘Property Damage- $5,001-$10,000’ to use in a Property Damage type. Simply enter the required label into the grid. Save. Incident Analyst V5 wizards are accessed from the incident tab. An icon for each wizard can be found in the left hand tool bar. 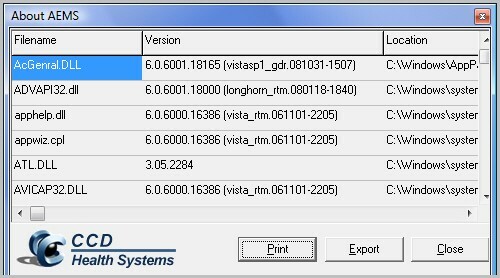 Two wizards are included with Incident Analyst V5, the first is used to import data from a variety of sources including physicians from the college and the spreadsheets found on your installation CD. The second wizard is used to support de-identification and archiving of closed events. The new user wizard is used to create for the Incident Analyst V5 system. For a user to be added to the system, an employee must first be created. The New User Wizard allows administrators to perform both tasks conveniently in one place. To begin, select the ‘Users’ tab from within the Security module. Click ‘New’ to open the wizard. Three options will be displayed. ‘Create an Employee’, Find Existing Employee’, and ‘Import Employee From Another System’. Select one and click ‘Next’. For more information on users, please see the ‘System Setup’ section of this manual. The import wizard is used to import physicians from the Provincial College of Physicians and Surgeons, employees from your HR system, clients from your CPI (if a live ADT link is not maintained) and, on a one time basis, data from the installation spreadsheets. Click the import wizard icon to launch a screen similar to the one shown to the left. Then select the type of import. After clicking next you will be prompted for a variety of information depending on the type of import chosen. Typically, this will include the location of the target directory and selection of the appropriate file format. In the case of physicians, this would be the location of the source file and the issuing province. Once the import has been completed you will receive a confirming message. You may then click finish to close the wizard. De-identification is the process of removing all information related to an event, or range of events, that could be used to identify a person. Based on privacy protection legislation, we recommend de-identifying events prior to archiving. De-identification allows event analysis without compromising client confidentiality. Naturally, the system also has the ability to archive events without de-identifying. After clicking ‘Next’ you will be prompted to select a closed before date, facility, and department if necessary. Next you will be asked to narrow down the events further. Select the correct phase and use the checkboxes to select the Types you would like. Click the ‘Next’ button. A page displaying the records that are queued for processing will appear. After clicking Finish, you will be presented with a progress dialogue. Once the process has been completed, click ‘Done’ to close the wizard. The Incident Analyst V5 profile is used to store general information with regard to this module and your facility. This section is divided into the four tabs described below. The General tab of Incident Analyst V5 Profile area displays information such as the Contact name and Phone number of the support person(s) for the application, the Installation Date and Current Version. There are some options displayed below. Select the options you would like. These include: Allow Deleting Events Without De-Identification, Enforce HIPAA Compliance, Use 24-hour Time Format, Re-notify Functions When an Event is Modified, and Automatically Open the Info Page. The Re-notify option has two options below it as well. Select whether you would like to re-notify automatically or if you would like to prompt the User. Auditing options can also be selected. If the Administrator would like to enable auditing, select the checkbox. You can also select events in specific phases that can be enabled to be viewed in an audit. Auditing of Event Fields can also be enabled. Use the text fields and check boxes to select the options you would like. The locations tab is used to define the directories associated with Incident Analyst V5 as well as the email servers. The locations are used for specific tasks, such as where to save attachments, log files, the audit directory and more. Directory addresses may be typed in or selected by browsing utilizing the “open folder” icon. Select the appropriate location. Enter the locations of the Incoming and Outgoing email servers and well as the Default web URL and the Web Help Directory. This section allows Administrators to select options for incoming and outgoing email. To begin, complete the ‘Emailer Cycles’ section. Type in the number of minutes you would like as a delay before notifications are sent, then type the number of days you would like in between email notification reminders. The next section is ‘Locations’. This is where Administrators choose the incoming and outgoing email servers, the log file directory, the email log file name, and the email from address and name. Type in the respective information. You can then select the ‘Lock username field during email login’ checkbox if required. There is also an option for functions to be re-notified when an event is returned to a previous phase. Click ‘Save’. The Facility Options tab is to select the fields collected on the first page of a report and the fields returned as a result of a search. This tab is also used to customize the look and feel of your Incident Analyst V5 web pages. Facility specific options may be selected from here. Select the required facility from the drop down list. Use the Web Display Profile and the Field Option Profile forms to customize the site further for each facility. A preview of the Web Display is shown on the right. Please see the ‘Web Display Profile’ and ‘Field Option Profile’ sections for more information. The next section is the Facility-Specific General Options section. Select the checkboxes if you would like to allow anonymous report creation, force exact match searches, or automatically register validated Web users. Validating Web users is useful when a person logs in through an external source and does not have an Incident Analyst V5 user account. If this is enabled and the person’s login was successful, Incident Analyst V5 will create a user using the rights specified below. To assign rights to the created user click on the ‘Search’ button and select the appropriate person to copy the rights from. Click ‘OK’. Next, Administrators may specific the page users are referred to after clicking on the ‘Finish’ button after creating an event. This page may be different if anonymous users are allowed. Administrators may select pages based on whether or not the user is logged in. Images may be assigned for the splash screen, header and the main page. Enter the name of the folder where the image is located as well as the image’s name. For example, you would enter ‘images/splash.jpg’ if your splash page image was located in the ‘Images’ folder and named ‘splash.jpg’. The setting on this page will override the selections made in the Web Display Profile form. A different colour schema may be implemented for organizations with multiple facilities. This customization is useful to managers when viewing event listings. Each facility may appear with its own colours when found with the ‘Find’ or ‘Info Center’ menus. Colours may be changed for the page background, table background, table border, header colours, and font colours, as well as the font itself. Images may also be assigned in this section. Images may be assigned for the splash screen, header and the main page. Enter the name of the folder where the image is located as well as the image’s name. For example, you would enter ‘images/splash.jpg’ if your splash page image was located in the ‘Images’ folder and named ‘splash.jpg’. Click the colour box next to the object you would like to change. A colour picker will appear allowing you to choose the correct colour. To change the font, click on the button next to the type of text you would like to change. You will be able to choose the correct font from the list. You are also able to choose a new font colour. The process is the same as if you were to change the page background colour. For both tabs, use the ‘Quick Assign’ button to assign to profile to specific facilities. Use the check boxes to select the appropriate facilities and click ‘OK’. Use the ‘Select All’ button if changes are to be made to all facilities. To select the fields you would like displayed, click the check box to the left of the option. There is also a checkbox to make the specific field mandatory. Mandatory fields must be completed prior to moving on to the next page of creating an event. You may also select the fields you would like displayed on the search screen. To select the appropriate fields, click on the check box beside the option. Two types of reporting are available with Incident Analyst V5, a set of standard reports and custom reports. Incident Analyst V5 is installed with a set of standard reports which were developed utilizing Crystal Reports®. These reports may be modified to meet your requirements using Crystal Reports. A database view generator is also included to allow building of customized reports with any third party reporting tool. Project Maintenance is the section where project details can be managed. Projects are used to create Views, which in turn can be used to run custom reports. A Project is a collection of related Collection List items that can be used for reporting. See the section titled Collection List Maintenance for more details regarding collection lists. Because of the very flexible way the system can gather information, reporting on that information in a usable manner can be difficult. A Project is used to pull data definitions from one or more related Collection Lists and unify it into a database View. Database Views are useful for a number of reasons, but the most compelling reason is that they restrict access to information to only what is enabled by the View (which has security and simplicity benefits). When a Project is created and saved to the database, a View with a similar name as the Project’s Name is created. This View defines a way of looking at the existing data, much like a database Table which contains a copy of the data that already exists, but organizes it in a different way. A View generated from a Project will be able to gather together those events that have collected answers to the Collection Lists that are defined for the Project. Events that have answers only for other Collection Lists will not be available, greatly simplifying the process of reporting. When the initial screen is shown, it will display information similar to the picture below. It will include the View name, description, a check box indicating if the view has been generated and if it has, when was it last generated. To display or modify the projects information, double-click the name in the grid. A modal form will appear. The treeview lists the Collection Lists that are available for reporting. If the Collection List contains one or more collectable elements, then the Collection List will have a check-box beside it, and will be checkable. Expanding the Collection Lists reveals the Rows in each Collection List. Rows with collectable elements will also be checkable. Expanding a Row reveals the Columns that are defined for the Collection List. If the Row/Column for a Collection List identifies a collectable element, then the Column will be checkable. Expanding a Column reveals the Item details for that Row/Column within the Collection List. Clicking on any of the items in the treeview will display more information for that item in the section below the treeview. After you have made your choices, and the form is saved, you will then be able to query the view using your reporting tool and create a custom report based on the selections you made. The standard Incident Analyst V5 reports are accessed through Users’ browsers based on the privileges they have been assigned. After selecting a report from the Report Menu, the User will be presented with various runtime options depending on which report was selected. For more sophisticated Users, a data dictionary and an entity relationship diagram are available to assist in the generation of custom reports. The tabs in the Report section allow Administrators to select where they would like the reports to be saved, the parameters displayed, the roles you would like to be able to access a specific report, and more. The three tabs all have two buttons at the bottom of the screen, ‘Save’ and ‘Close’. Report Information also has a ‘Delete’ button to delete the selected report. To view a report’s information, select it from the drop-down list. The information will then be loaded into the displayed fields. Text Fields with a grey font cannot be changed in this area. The selected reports information will also appear in the other two tabs. Report information displays the Report Label, Crystal Filename, Preview Name, and the Web Folder Name. There are also text fields to type in a short description on the report as well as a roll-over hint. Only while creating a new report is the Master Report drop-down available. When finished with this page, click the ‘Save’ button. This tab allows Administrators to select or view the fields they would like displayed in the report. To use this page, select a report from the drop-down if you have not already selected it in the Report Information tab. As with the Report Information tab, the information displayed in this tab will also be displayed in the others. When creating a new report, a field list will be displayed below. Each parameter has a drop-down list to the right of it. Use this list to select how you would like the field displayed, if at all. Administrators may also create custom parameters. To do this, click into the custom parameters fields. The field you selected will be highlights. Type in the necessary information. Click the delete button to the right to delete the custom parameter and ‘Edit’ to edit a parameter. When finished, click the ‘Save’ button. Use this tab to set which roles are able to use which reports. Double-click the role. A modal form like the one below will open. Expand the list to view all reports. Select the check boxes to the reports you would like this role to access. You may also enable or disable all the reports from the role. When finished, click ‘OK’. 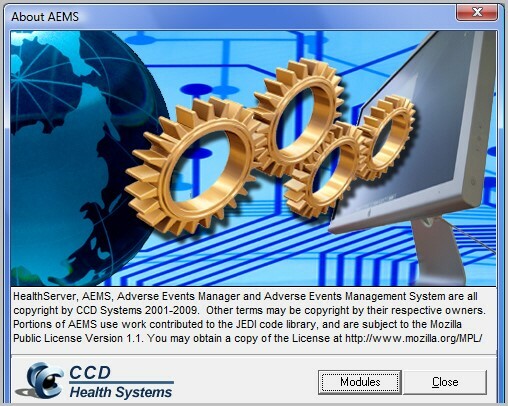 The reports section of the Adverse Event Manager allows Administrators to create new reports as well as maintain and/or change existing reports. Select ‘New’ from the drop-down list in the Report Information tab. Click ‘Add New’. Complete the fields below and move on to the Report Parameters tab. Set up the parameters using the drop-down lists. If you would like, add custom parameters at the bottom of the screen. Move onto the Report Role Access tab. Select the Roles you would like to be able to use this report. Click ‘Save’. To alter the contents of an existing report, select the Reports tab at the left side of the screen. On the Report Information tab, select a report from the drop-down list. Its information will then appear in all three tabs. In each tab, change the fields you would like. Fields with grey font cannot be changed. Click the ‘Save’ button at the bottom of the screen to complete your changes. This utility exports data from CCD’s database. The initial screen will display existing exports in grid format. Double-click on an export. This will bring up a new modal form. The new form will display the Export Label and description at the top of the page. There are two tabs below, ‘Columns’ and ‘Preview’. This section allows Administrators to order the reports columns. To add a column, make a selection from the left-hand list. Click the > arrow button. This will add that selection to the viewable list. Likewise, if you would like to delete a selection, highlight it from the list on the right-hand side. Click the < arrow button. Towards the bottom of the screen, in the settings tab, the justification of the column can be set to Left, Right, or Centred. The field length, position, and fill colour can also be set in this area. Quantity and the XML Label are also in this area. All of the data with a ‘1’ value will be converted to ‘BC’ in ‘Preview’ or ‘Run Now’. This section lets you preview your export selections. Make selections from the dropdown lists. Click the check buttons if you would like to include potential events or open events. The next area determines the format. You may choose delimited report or fixed-length. Select ‘Include header in Export’ if necessary. Click the ‘Preview’ button to see what will be exported. Click Run Now to generate the export as a file. Click ‘OK’ to save your changes and return to the previous screen. To assign the days and times the exports should be run, double-click on an export in the grid. A modal form will be displayed. The schedule label and description will be displayed at the top of the form. In the Schedules tab, there are two sections, Scheduling and Timing. Select when you would like the export to be run, daily, weekly, monthly, or on a custom set day. Administrators can select if the exports should be run on weekdays, weekends, or both if Daily is selected. The specific day may be selected when Weekly is selected. When monthly is selected, a specific day may be assigned, such as the First of the month. There is also an option to select if the export should be run on the third Tuesday of the month, for example. The Custom setting will display a calendar to choose a day that fits with your requirements. The timing section displays when the export will be run next and the last time it was run. Administrators can asset the time the export will be run in this section as well. The Exports tab allows Administrators to view details about the export, such as the facility, department, type, phase and severity of the export. It also sets where the export is sent. Interface Maintenance provides a place to manage interfaces purchased by your organization. The tab will open to its default tab ‘Interfaces’. The Interfaces tab allows Administrators to manage the connections between Incident Analyst V5 and third-party databases. To add a new interface, click the ‘New’ button. If you would like to delete an interface, select it from the list and click the delete button. Underneath is a section that displays the ADO connection as well as the LDAP. Type the strings into the text box. When you are finished, you can either ‘Test’ or ‘Build Connection’. Click ‘Apply’ if you would like to apply your changes to the system. This tab is used to link created interfaces with the proper facility. To do this, select the facility from the drop-down list. Do the same for Clients, Employees, and the Drug / Formulary. Use the next section to add the interface. Select the interface from the drop-down list. Click ‘Add’. It will appear in the box below. To remove an interface, select it from the box and click ‘Remove’. Incident Analyst V5 is comprised of three standard web pages plus the web pages generated based on the set-up parameters. The first standard web page is the Incident Analyst V5 home page. Your CCD implementation consultant will have worked with you to provide an Incident Analyst V5 home page that is consistent with your organization’s web presence. The second page is the standard login screen, logging in to create reports will be optional if you have selected ‘Allow Anonymous Report Creation’ in the incident profile. However, logging in is mandatory before reports can be edited or events reviewed. Once logged in, Users may create new events, search for and review reports based on the event details with refinements based on a date range and/or a time period (e.g. shift) or maintain their passwords. A third standard page is the ‘Finish’ page. To finish the event creation process, click the ‘Finish’ button. Select the check box if you would like to finish the event at a later time. You are also able to print and view the event by clicking on the ‘Search’ and ‘Print’ buttons. Throughout the creation and review processes, the User is presented with web pages generated based on the set-up parameters. During the creation phase, the User is presented with an initial page to collect base information as defined in the profile. This information generates the following page(s) which are used to collect people affected by the event, who is notified along with answers to the questions defined for that event type. You will note that a third page will be generated if required for ancillary questions. 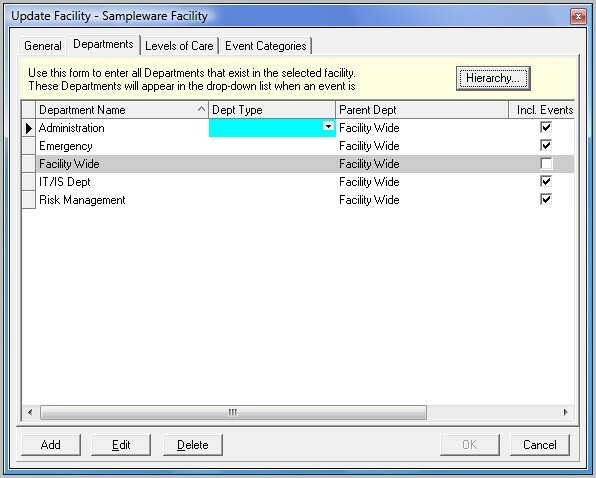 The Departments and Event Types displayed correspond to the Facility and Event Type selected. Different Facilities and Types may display a completely separate set of questions than another Facility or Type. Use the drop-down lists, check boxes, radio buttons, and text fields as needed. Fields marked as were set up to be mandatory fields, meaning that these fields must be completed before the User can move on to the next page. The second page displays questions and collection lists that were defined during set up. It may be displayed based on different terms, such as Event Type. These fields should be completed to the best of the User’s ability. Incident Analyst V5 was designed to run in a 2 or 3 tier environment –specifically workstations with Internet Explorer accessing MS SQLServer, Active Server Pages (ASP) through MS IIS Web Server. Event management (creation, review, reporting, etc.) is performed through the Web browser while setup and configuration and system administration is achieved through Incident Analyst V5 set-up application. Typically, the database is stored on a separate server (3-tier), but may exist on the same server as either the IIS server or the Setup application in a 2-tier configuration. This requirement refers to both the computers running the SQLServer Database as well as the computer running the IIS Web Server application. For security reasons, we strongly recommend running 2 separate servers networked to allow Web access to the database. This workstation is used by Risk Management and/or IS Dept. personnel to run the Incident Analyst V5 configuration utility in order to modify data collection setting. Once configured, ongoing access occurs rarely. Note – support for Windows 95 was dropped in 2002 because of security issues not available to this operating system. This Step-By-Step list is for reference. Depending on the facility, some items may not be required or they may have already been entered. 1 Licensing Make sure the facility you are adding has the proper license and task assignments. 3 Facility Tab Add the Facility into the Facility tab and assign to a parent facility. 1 Type Details Drag and Drop Event Types to create Type Nodes and build the Type Hierarchy. 2 Type Details Assign the following options to each type: Assignable to Event, Include in Event and Process Point. 4 Type Details Add the facilities the Event Type will apply to. 5 Type Details Add the correct phases for the event. 6 User Entered Lists Assign the proper collection lists to the correct event types by modifying the filters. 3 Add New Row and Re-name it according to what it is going to represent. 5 Select the appropriate Response Type, Data Source, Alternative Group, Question, Label, Max Characters, Justification, Span Columns, Cell Colour, Font Colour, Border Colour, Req’d if supplied, Mandatory Flag, Start Collapsed, Active Flag, Clear on De-identify, Link to Question, Image Link, and Instructions selections for each column. 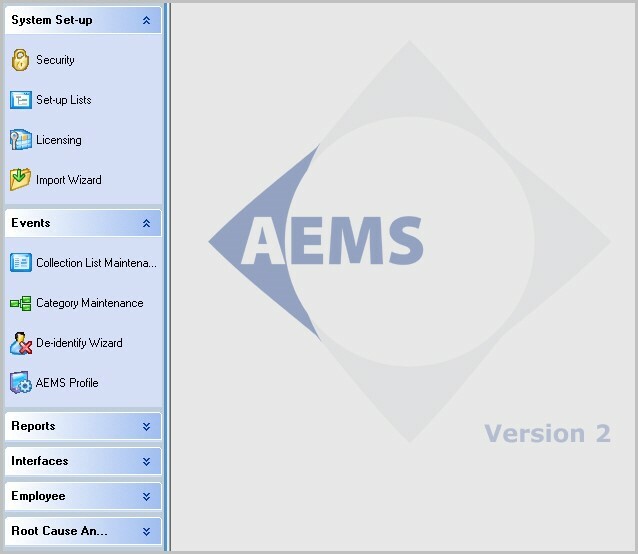 Employees and Users are both present in the Incident Analyst V5 system. Understanding the differences between a User and an Employee is a necessary task in order to create a user. This is explained below. Employees are used as participants in events. Employees are not required to be users. Users are provided with a username and password in order to create events. However, a User must be an employee. This means that an employee must be created first in order to create a user with the same name. 1 Set-Up Lists – Employees Check to make sure that the employee that is required is already in the system. If not, create an employee by clicking on the ‘New’ button. 2 Set-Up Lists – Employees Go through each tab and enter as much information as possible. 3 Set-Up Lists – Employees When finished, click ’OK’. Keep in mind that this can also be done in the Security Module – Users Tab. Use which every method you feel most comfortable with. Also remember that after an employee is added, the process to finish adding a user is the same, no matter which method you began with. 1 Set-Up Lists – Employee’s Tab Check to make sure that the employee that is required is already in the system. 2 Security Module – User’s Tab If not, create an employee by clicking on the ‘New’ button. 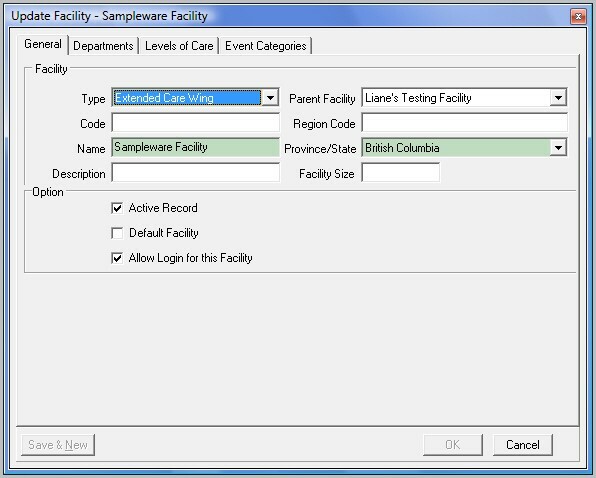 This will open the New User Wizard Select the option ‘Create New Employee’. Click ‘Next’. 4 Security Module – User’s Tab Click ‘Finish’. This will open the ‘Create User’ portion of the wizard. 1 Security Module – User’s Tab Once an employee is entered into the system, they can be added as a user. Click the ‘New’ button if the wizard hadn’t been used to add the employee and select the ‘Find an Existing Employee’ option and find the correct employee. If the wizard was used, you will be brought to the proper screen automatically. 2 Security Module – User’s Tab – General Tab Enter the employee’s basic information into the General Tab. This is where user names and passwords are assigned by system administrators. Once all information is completed, click on the next tab. 3 Security Module – System Roles This section is where system administrators can create a role or ensure that a role has already been created for the user. Enter the role’s name as well as a short description of the role, such as the specific type of employee that would get this role. This might be a manager or general employee among many others. To select actions, expand each section one at a time by clicking on the +. Scroll through the listings and check the box is that action is required. Checking the box on the topmost option of that section will select all others underneath it. Likewise, if the box is deselected, the options underneath will be as well. Choose as many actions as are required. 4 Security Module – User’s Tab – Role Assignment This section is where system administrators can choose actions the user can perform on the website and in the setup utility. For example, a low-level employee would need to be able to enter events, add comments and participants and they would be able to see their Events Created. You would create a role with these permissions if one hasn’t already. In the Role Assignment tab, highlight the role required and click the >> button. Select as many roles for the user as required. Click on the ‘Event Permissions’ Tab. 5 Security Module – User’s Tab – Event Permissions This is where event administrators determine if users can access events based on specific facilities, departments, types, phases and more. If another user has exactly the same permissions, you can copy them from the user by clicking the ‘Copy From User’ button in the upper right hand corner of the modal form. To assign permissions, click ‘Add’. Select the appropriate level of care, facility, department, and phase from the drop-down lists. To limit access to events based on the severity, click the ‘Edit’ button to the right of the Severity text field. This field will default to ‘All’. Check the boxes corresponding to the actual and potential severities that the user will be able to access. The option for the user to view actual or near miss events is on the right hand side of the modal form. Select one or both as required. Select the access rights required for the user. These are based on the confidentiality of the event. The selections are described below. None The user is not allowed to do anything to events with this level of confidentiality. They cannot view, edit, or advance the events that possess this confidentiality. View The user can view, but not edit or advance events with this level of confidentiality. Edit The user can view and edit the events that have this level of confidentiality. Admin The user can view, edit and advance the events that have this level confidentiality. 6 Security Module – User’s Tab – Current Functions This section lists the functions that are assigned to the employee. Understanding functions is important in being able to assign the proper users to them. A function is similar to a work position such as supervisor, risk manager or even a Chief of Emergency Medicine, for example. These people are normally required to fill out very specific paper forms as an event progresses. Within Incident Analyst V5, the function is notified electronically based on a number of variables which may or may not include severity, department, confidentiality and much more. Once these notifications are sent, the user assigned to that function will be able to review the event accordingly. 1 Setup Lists – Functions Ensure that the required function has been created. If not, Add one by clicking ‘New’ and enter the required information. 2 Security Module – Facilities – Departments Tab Select a facility and click the ‘Edit’ button. Go to the Departments tab. If the appropriate department had been added, click ‘Edit. If the department has not been added, click the ‘Add’ button. Enter the department, the department type, and parent department as needed. Select a function from the drop down list. Click the + button. The function will load below. Use the ellipses to find the user. Once a user is found, administrators will be given the option to use the email address currently assigned to that user, to look up the users email address at the time of notification or to input another address. Select an option by clicking on one of the corresponding radio buttons. Multiple users can be entered as long as the combined email addresses, with the separating comma, comply with the maximum number of characters allowed. To enter more than one user, type the user’s names and separate them using a comma. Enter their email addresses in the same manner. Click OK in the Departments modal form. Also click OK in the Facility modal form. Assigning notifications to a function is not the same as assigning a notification to a specific user. Notifications to a function are the same as notifying a specific job position, like forwarding the paper work to a supervisor. Although the notification will ultimately be sent to a person, it is sent to the function or position that is assigned to be notified in that event type. 1 Type Maintenance Select the type for which the notifications are going to be sent out. 2 Type Maintenance – Auto Assigned Lists – Notifications Click ‘Add’. Enter the required function from the drop down. Do the same for notify type and phase. Select if the function is to be notified based on if the event is confidential or not. Use the ellipse to select the actual and near-miss severities the function is to be notified about. Repeat these steps for each of the phases the function will be notified for. Exceedence notifications are sent when event counts in a certain type are above the assigned number. These notifications serve as a warning about problems within areas of a facility. 2 Type Maintenance – Exceedence Notifications Click ’Add’. Select the facility that the notification will be regarding. Use the ellipses to select the actual and potential severities and select to include actual events and to include near miss events. Select how often the notification should be sent out. This could be Hourly, Daily, Weekly, Monthly, Quarterly, or Annually. Enter the number of events that will trigger the notification. Next, enter the user that will be notified. Use the ellipses to find the correct user. Incident Analyst V5 is a fully customizable application. As such, various words within the website can be changed according to the terminology used by your facility. It is very important to recognize that close attention must be paid while changes are being made in this file. If there are any questions or concerns, please do not hesitate to contact a CCD Systems Client Solutions Specialists before any alterations are made. There are two ways to change the terminology within Incident Analyst V5. How alterations are made depends on where the change is required. For example, CCD collection list labels can be changed in the setup utility. This change is only seen in a few places which makes it simple for the set-up utility to handle the task. However, certain words, such as ‘Event’ and ‘Facility’ are used in a number of places from the start page to reporting and the Info Center. These changes must be made in a separate file. Label changes can be essential when working with CCD collection lists because the terminology you might be accustomed to may not be the terminology that is used. The steps used here will apply to any CCD made item from collection lists to causes and contributing factors. This example will use the CCD_Attachments collection list. This collection lists is used to attach files, photos, even other forms to an event. For the purposes of this example, we will change the label ‘Attachments’ to ‘Documentation’. 1 Find the correct item in ‘Set-up Lists’. In this case, you will be looking for Collection Lists and the CCD_Attachments collection list. Double click the required item to open the modal form. 2 Fields that cannot be changed are recognized by their grey font. Fields that may be changed will be seen in their regular colour. In the case of the label, it will be shown in black font. Highlight the word Attachments and enter the word ‘Documentation’. 3 Click OK.’ Your change should now be seen on the website. The Language.asp file is contained within the ‘Custom’ folder of your Incident Analyst V5 program files and folders. Double-clicking this file should open it in Word Pad. You will see a number of text blocks that look similar to what is shown in the example below. For our example, we will change the word ‘Event’ that is displayed in a number of places on the website to the word ‘Incident’. A few places that ‘Event’ is seen are the Start page, the Info Center, and Page One of Even Creation, as well as in the Header of Page Two, although it is seen elsewhere as well. 1 Open the Custom folder then the Language.asp file. Scroll down until you find the block of text that is displayed below. 2 Be sure to leave the first line (‘EVENT) alone. Changing this will create problems in the system. The lines marked with (CONST) can all be altered. Be careful to change only the words coloured in grey within this manual and nothing else, particularly the quotes. Again, changing other parts of the code will create problems in the system. The first line is the capitalized singular version of the word, the second is the capitalized plural of the word, the third is the lower-case singular version, the fourth is the lower-case plural version and the fifth is the lower-case possessive of the word. Go through the text block and change the ‘Event’ words to the appropriate context of ‘Incident. Save the Language.asp file after all changes are made. These changes should now be seen on the website. Notifications can be sent based on many different criteria and for different purposes. This section will outline the notification types available. You have received this message because your e-mail address is listed as a participant to provide comments for the following event. This email is sent if more than one user is required to enter information within the phase the notification was sent. This email is sent if the person is only required to provide comments to the event. This means that the person is not able to answer any of the questions that would be asked for that event within the phase the notification was sent. The notification is sent when any changes have been made to the event. A person is notified with this email when they are required to complete a follow-up action related to that event. This email is to allow the recipient to view the event for the phase the notification was sent as well as previous phases. The recipient is not required to complete any tasks. This is sent to an individual when they are required to answer additional questions. This email is sent to let the recipient know that an event occurred within the set criteria. This notification will not allow the recipient to view the event as a link is not provided. This notification will be sent to the person who is indicated to be the Report Creator (the person who initially entered the event.). Keep in mind, this will only be sent if a valid address is provided at Event Creation. This is used to keep the creator informed of the event. This is sent to the individual responsible for the event. This individual may answer additional questions as well as administer the event (i.e. advancing the phase. This is useful when more than one persons input is required. This notification will allow the recipient to answer all of the questions asked within that. Two or more sets of data will be saved depending on the number of people who received this email. <br/> This indicates that a new line starts at this symbol. If you do not include appropriate breaks in the template, then the contents will be assumed to have no line breaks at all. When you want a blank like to appear between blocks of text, place a <br/> tag on a line all by itself. <field> This indicates that the text between the <field> and </field> tags is to be replaced with actual content from the database relating to the event the recipient is being notified about. The list of available fields is quite extensive, and not all fields will be available for all events in the system. Link The fully-constructed web address that will link directly to allow the user to edit or review the Event. WebLink The actual HTML tag that will be inserted into the email message that will allow one-click access to edit or review the Event. Inyx.IncidentIRPhaseName The name of the Phase that the Event was in when the email was created. Inyx.emailaddress The email address of the intended recipient. Inyx.NotifyTypeName The descriptive name of the type of notification being sent. This is usually a short description “why” the email is being sent. Inci.FacilityName The name of the Facility the Event occurred in. Inci.DeptName The name of the Department the Event occurred in. Inci.IncidentTypeName The name of the Type of the Event. Inci.ActualSeverityName The name of the Actual Severity of the Event, if specified. Inci.PotentialSeverityName The name of the Potential Severity of the Event, if specified. Other available fields are documented in the QueryData.Log file. Five emails are sent automatically once a week. These notifications are regarding how many of what kinds of emails had been processed by the system in the past week. Duplicate Message These are messages that didn’t get sent because an e-mail of the exact type and contents has already been sent to this person. This happens when a notification is sent, for example, to the Head of a Department and the Risk Manager, both of whom are the same person. Duplicate messages aren’t an error, but if the service is processing many of them, it may indicate that the Facility/Department/Function structure isn’t set up efficiently. Permanent Errors These are messages that couldn’t be sent because there was an error processing the contents of the e-mail, usually because the e-mail address is invalid (like supportccdsystems.com, or support@ccdsystemscom). These errors will also be sent out in the Daily Error Summary, with details as to what caused the error. In cases like this, the best course of action is to correct the cause of the error, rather than trying to modify the notification itself. Following the example, it is best to find out where in the system the email address supportccdsystems.com is entered, and fix it, so that future messages get sent successfully. Temporary Errors These are messages that couldn’t be sent for unknown reasons. The message itself seems to be valid, but there was still an error in sending. An example of this would be if the SMTP server was down when the message tried to send. The current best course of action would be to identify the cause of the error by identifying when the errors failed to send, then fix the cause of the error. We are in the process of creating a utility that will help you to identify and re-submit messages in this state for re-sending. Abandoned Message These are messages that were scheduled for sending, but when it came time to send, the message had already entered a Closed or Abandoned state. This happens most often with notifications that are sent as soon as an event enters the “Event Created” state, and the user decides to delete the event before it is complete. This is not considered an error in itself, but if there are many of these, then it may be advisable to attempt to identify why these events are being abandoned or closed before these triggered e-mails can be sent, and consider a change in policy, or in the flow of events from one phase to another. In certain circumstances, a user may not have the appropriate event permissions assigned to access an event that they have been notified about. Rather than give the user permissions to that event if they aren’t normally required, an override account may be used. This account is set on the specific notification type and will be able to temporarily lend its permissions to the user receiving the notification in order for them to view and review the event as needed. If the notification sent in an Information Only or Comments Only notification, the user it’s sent to will be able to see the information that has already been entered for the event regardless of their permissions. They would be able to see only this event if they don’t have the necessary permissions to ordinarily log in and see it. In the case of Comments Only, the user will only be allowed to enter comments. No other changes to the event will be permitted. The other kinds of notifications, like Manager Review, Collaboration, etc. would require that the user have the correct permissions unless the notification type is set up using an override account. When using an override account, it doesn’t matter which permissions the user has, once they click on the link in the email, they will be given the permissions to review that event. The first step in creating an override account is to create a user that has all of the necessary permissions. You may also need to create a new employee as well. It’s possible, as well, that you already have a user that has all of the correct permissions, in which case, you can just use them. Then you will need to go to Setup Lists and find Notification Types. Find the notification type that is being used and double click on it. Towards the bottom right hand corner of the window, there will be a drop down list labelled Override Acct. go down the list until you find the user you want to use and select them. Click OK.
Keep in mind that once this notification is set up with an override account, every time this notification is sent, the user it is sent to will pick up the permissions of the user set as the override for that event. You’ll have to make it clear to users that this is the case and to only send that kind of notification when necessary. These are used for custom reporting. Fields can be selected and reported on as needed. There are a number of CCD Views. Each is summarized below. Phase The test representation of the event phase. PhaseID The numerical representation of the event phase. Facility The text label of the facility the event is related to. FacilityID The numerical representation of the facility. Department The text label of the department the event is related to. DepartmentID The numerical representation of the event department. EventCategory The text label of the event category. EventCategoryID The numerical representation of the event category. EventType The text label of the event’s type. EventTypeID The numerical representation of the event type. ActualSeverity The text label of the event’s actual severity. PotentialSeverity The text label of the event’s potential severity. Confidential If the event is to be confidential. Potential If the event was an actual or near miss event. BringForwardDate When the event is to be sent to the next phase. Location The text label of the event’s location. LocationID The numerical representation of the event’s location. CareTeam The text label of the care team involved in the event. Resolution The text label of if the event has been resolved or not. ResolutionID The numerical representation of if the event was resolved. CreatedByPersonID A number assigned to the person who created the event. Note that this field is not to be used in the future. The ‘CreatedByUser’ field is to be used instead. LevelOfCare The text label of the level of care in which the event occurred. LevelOfCareID The numerical representation of the level of care. ModieifedBy_UserID A number assigned to the person who modified the event. EventDeleted If the event has been flagged as deleted or not. Time_Display The occurrence time without the date included. ProbabilityID The number of the probability of an event happening again. Probability The text label of the probability of reoccurrence selected. RiskScore A combination of the severity and probability scores assigned by the Risk Managers. CreatedDateTime The date and time an event was created. CreatedByUserID A numerical representation of the user who created the event. CreatedByUser The text name of the person who created the event. DiscoveredDate The date an event was discovered. DiscoveredTime The time an event was discovered. ReportedDate The date an event was reported. ReportedTime The time an event was reported. ReportedByMethodID A numerical representation of how the event was reported. ReportedByMethod The text label of how the event was reported. ReportedByEmailAddress The email address of the person who reported the event. ReportedByPhoneNumber The phone number of the person who reported the event. ExternalID The event ID number that is assigned. For example, if the event is printed and stored elsewhere, the ExternalID would be the file number of where the hardcopy is stored. CauseID The numerical representation of the cause. Cause The text label of the cause. CauseGroupID The numerical representation of the cause group. CauseGroup The text label of the cause group. CommentID The numerical representation of the comment. CommentText The text entered as the comment. EnteredBy The full name of the person who entered the comment. EnteredBy_FirstName The first name of the person who entered the comment. EnteredBy_LastName The last name of the person who entered the comment. PersonID The number assigned to the person who entered the comment. CommunicationID A unique number that represents a communication. CommunicationType The text label of the communication type. This may be an e-mail or a letter for example. CommunicationTypeID The numerical representation of the communication type. CommunicationWasReceived If the communication was received or sent. If ‘yes’, the communication was received. If ‘no’ the communication was sent. CommunicationReceived The numerical representation. 1 means that the communication had been received. 0 means that the communication was sent. DocumentReference Includes references to items such as file or document numbers. Displays the name of the reference. SenderName The name of the person who sent the communication. SenderContactInfo The contact information of the person who sent the communication. SendDate The date the communication was sent. ReceiverName The name of the person who received the communication. ReceiverContactInfo The contact information of the person who received the communication. ReceivedDate The date the communication was received. DueDate The date the communication is due. AttachmentInternalFileName The internal name of the file that Is attached to the communication, such as an e-mail or photo. AttachmentFileName The proper name of the document. Comments Any comments included in the communication. NoteID A reference ID that refers to the comments table for storage information. Cost The cost of the communication such as postage. ModifiedDate The date the communication was last modified. ModifiedByPersonID The person ID number of the person who last modified the communication. ModifiedBy The name of the person who last modified the communication. PastDue Someone has not responded to the communication. 1 signals that the communication is past due while 0 indicates that the communication is not past due. IsPastDue Indicates that no one has responded to the communication using ‘yes’ or ‘no’. ContributingFactorID The numerical representation of the contributing factor. ContributingFactor The text label of the contributing factor. ContributingFactorGroupID The numerical representation of the contributing factor group. ContributingFactorGroup The text label of the contributing factor group. CostTypeID The numerical representation of the type of cost involved. This could be a follow-up task or communication. SourceID The ID number of what the cost relates to. This may be the CommunicationID for example. Cost The dollar amount of the cost. ModifiedByID The ID number of the person who last modified the record. ModifiedByName The name of the person who last modified the record. TaskName The text name of the task. Task_EmployeeID The ID number of the employee responsible for the task. Task_EmployeeName The name of the employee responsible for the task. Task_FunctionID The numerical representation of the function responsible for the task. Task_FunctionLabel The text representation of the function responsible for the task. Task_StatusID This is the status of the task. Each one is assigned a number and has a label. These are: 1-Incomplete, 2-Complete, and 3-Abandoned. TaskAssignedBy The name of the person who had assigned the task. DateAssigned The date the task was assigned. DueDate The date the task is due. DateStarted The date the task was started. DateCompleted The date the task was completed. TaskNoteText The text of the comment entered. Task_StatusLabel The text name of the task’s status, such as Completed. Task_AssignedTo The name or function of who the task was assigned to. FollowupActionID The numerical representation of the task. Notify If a function or employee is to be notified. This is indicated by a 0, do not notify, or a 1, do notify. FATask_NotifyDisplay If the notify field is set to 1, ‘Yes’ is displayed in this field. If the Notify field is set to 0, ‘No’ is displayed. Task Indicates if there are other tasks enabled such as collecting more details (e.g. comments). This is shown by displaying a 0, there are no other tasks, or a 1, there are additional tasks. CollectDetails Shows if details are to be collected. These might be comments or the date the task was started for example. EstimatedDurationUnit The numerical time period of the estimated length of time required to complete the task. EstDurationUnitLabel The text time period of the estimated length of time required to complete the task. Cost The cost required to complete the task. ReviewedBy The name of the person the follow-up was reviewed by. ReviewerPosition The position of the reviewer. ReviewerPositionID The ID number of the position. DateReviewed The date that the task was reviewed. PolicyReference Indicates the policy relating to the specific task. DocumentReference The name of a document relating to that specific follow-up. Position Where the medication was entered. FormularyID The ID number assigned to the drug in the formulary. ExternalID The ID number assigned to the drug through an external system. GenericName The text generic name of the drug. BrandName The text brand name of the drug. Ingredients The main ingredients of the drug. Validated Has the drug been validated? This is indicated by a ‘yes’ or a ‘no’. Administered Has the drug been administered? This is indicated by a ‘yes’ or a ‘no’. Dose_Amount How much of the drug was ordered. Dose_UnitID The number assigned to the units. Dose_Units The unit of the dose. Dosage_FormID The number assigned to a form of drug. Dosage_Form The form of drug given. This may be cpsule for example. Dose_FrequencyID The numerical representation of how often the drug was to be given. DoseFrequency How often the drug was given. Dose_RouteID The ID number assigned to the way the drug was given. Dose_Route The text label of how the drug was given. Dose_Strength_Amount The strength of the drug. Dose_Strength_UnitID The numerical representation of the amount of drug given. Dose_Strength_Units The measurement of drug given. DateAdministered The date the drug was administered. TimeAdministered The time the drug was administered. ManufacturerID The ID number assigned to the manufacturer. DistributorID The distributor’s ID number. Distributor The text name of the distributor. PackagingID The ID number of the type of packing the drug came in. Packaging The type of packaging the drug came in. StatusID The numerical representation of the drugs status. Status The text representation of the drugs status. Classification The text classification of the drug. NumberOfDoses The number of doses given of the drug. NotifyID This is the notification reference number. PhaseID The ID number assigned to the phase in which the notification as sent. EmailAddress The email address that was notified. DateQueued The date that the notification was entered into the system. SourceType The text label of the person type. This may be patient, employee or user selectable. SourceTypeID The numerical representation of the person type. Participation The text label of the type of notification, if the notification was sent to a user or participant. ParticipationID The name of the function that received the notification. Recipient The name of the function that received the notification. UserName The text name of the user who was notified. NotificationType The type of notification sent. NotificationTypeID The numerical representation of the type of notification sent. DateSent The date the notification was sent by Incident Analyst V5. CompletedReview Has a review been completed? This is indicated by a 1 or a 0. OutcomeID The ID number assigned to the outcome. OutcomeOutcomeGroupID The text label of the outcome. OutcomeGroup The ID number assigned to the outcome group. ParticipantID The number assigned to the participant involved in the event. ParticipationType The text type of participant involved in the event. ParticipationTypeID The number assigned to the participant type. SourceType The ext label of the person type. This may be patient, employee or user selectable. Identifier The identifier of a person. This may be the employee number or patient chart number for example. PersonID The person’s ID number. Name The name of the participant. EmailAddress The email address of the participant. PhoneNumber The participants phone number. DaysLost The number of days the employee has lost due to this event. ChangeDate The date the phase was last changed. ChangedBy The person who last changed the phase. ChangedByPersonID The person ID of the individual who last changed the phase. ChangedByUserID The user ID number of the person who last changed the phase. Severity The text label of the severity of the event. SeverityID The ID number of the severity of the event. AnswerItemID A number assigned to each field whether it be a blank cell, question or answer. AnswerType They type of answer requested. This may be a drop down list or check many. MasterQuestion The question that an answer relates to. Alternative An option displayed in check one, drop down, and check many lists. AnswerLabel The text relating to an answer. AnswerValue The value of the answer or the value of an alternative. AnswerAbbrev This is the first 50 characters of an answer value. BooleanResult A 0 indicates that a drop down, check one or check many is not selected. A 1 indicates that a drop down, check one or check many has been selected. AnswerCode This is a code for alternatives. This is the first 10 characters of the value. IsOpinion If an answer was given in response to a Second Opinion notification. AnsweredBy This is the person who answered this field. CollectionList Which collection list the answer belongs to. ColumnNumber Number of the column the item is in. ColumnName The name of a column used within the Incident Analyst V5 application. ColumnLabel The name of a column used on the Incident Analyst V5 website. RowNumber The number of the row the item is in. RowName The name of the row the item is in. AnswerID The ID number that relates to the answer. AnswerSourceID This is usually the ID number of an alternative. This may change in the future. ExportCode The code used to export the item to another application.